We slept really well in our exceptionally quiet room. 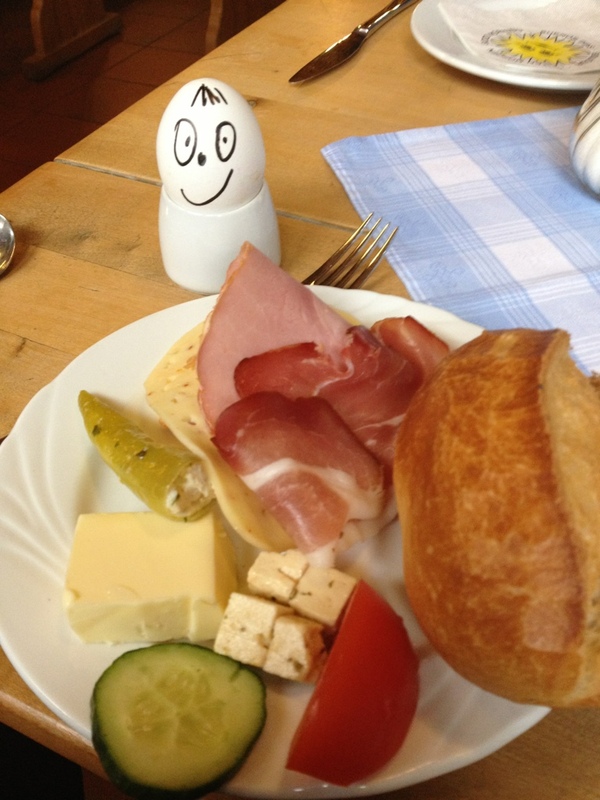 Breakfast was a very varied selection. The official route for today looked fine, not too many pointless detours and generally very high quality road surfaces (according to the Bikeline book which is not always 100% correct). 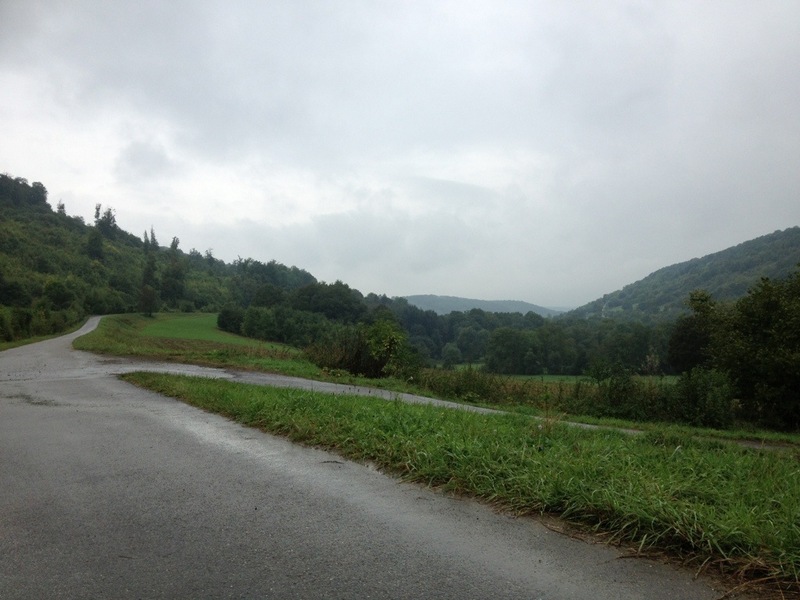 So we expected to pretty much follow this route which winds itself along the Tauber valley. We were underway by 9:15am under heavy skies but, initially, no rain. 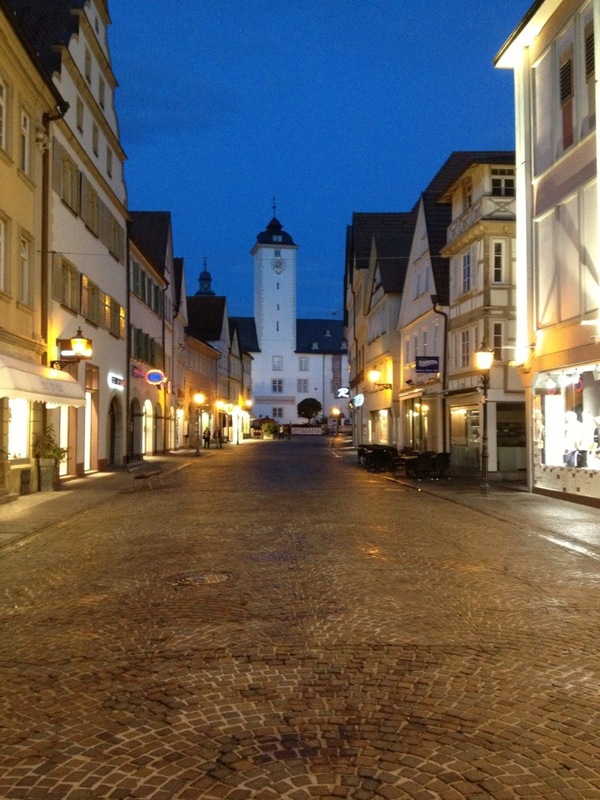 We bumped our way over the cobbles through the centre of Rothenburg (well worth a visit, folks!) and then popped out the other side, following not only the Romantische Straße route today but also the Liebliches Taubertal route (which had more obvious signage). 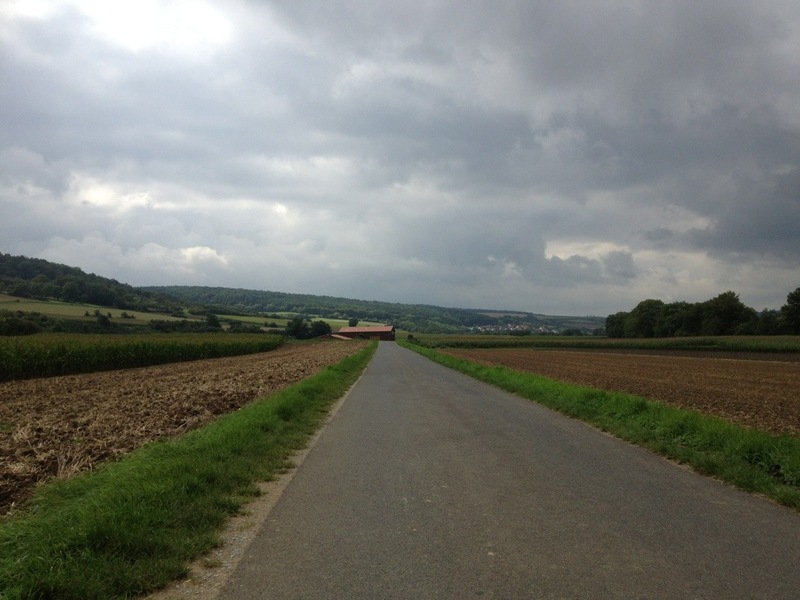 This route took us to Detwang and then across the Tauber to the western bank where we stayed for most of today’s ride, following the course of the river as it wound its way along towards Wertheim where it flows into the Main. 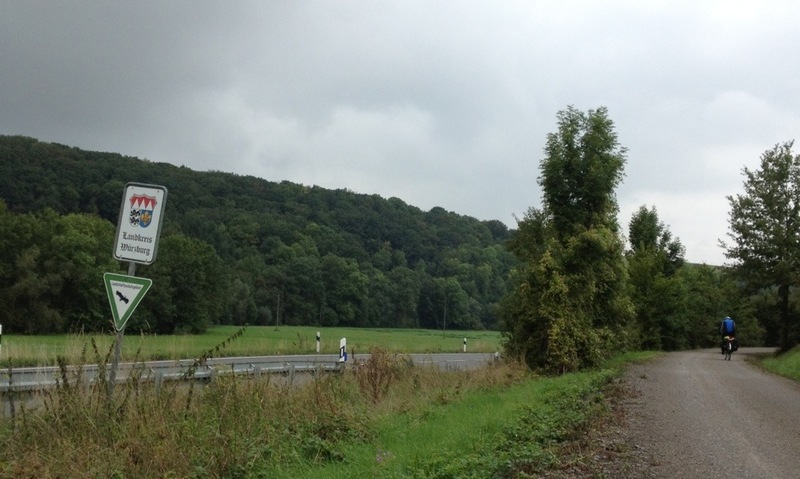 Near Langemühle I rounded a corner and saw a large rabbit sitting on the verge. I stopped about two metres from it and we looked at each other – it didn’t look like the wild rabbits we see at home, more like a big fat pet rabbit. James cycled past and it didn’t move, then I got the camera out and it hopped off. 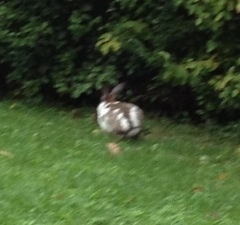 So here is my bad photo of the back end of a large rabbit! Today was a day of rather beautiful scenery, much more reminiscent of our previous river cycle tours than the landscape we’ve been travelling through up till now. 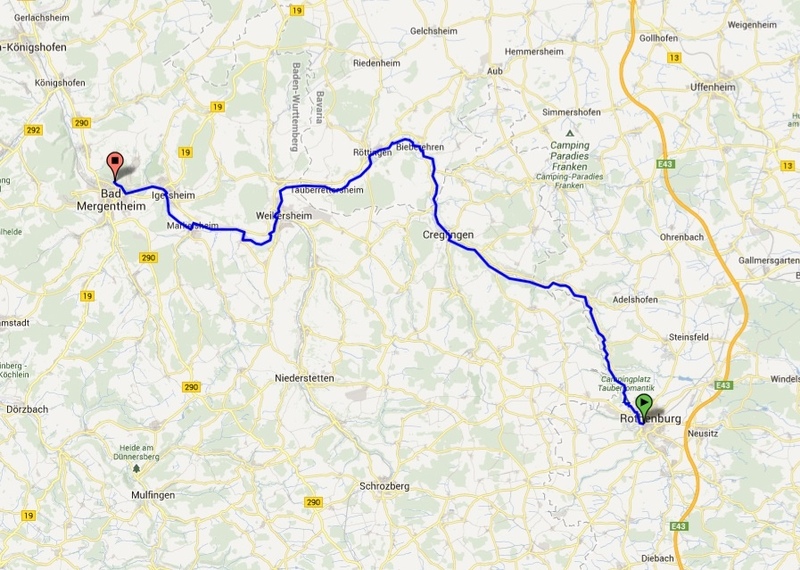 The route reminded us most of our ride last September from Nassau via Bad Ems to Koblenz which was another small river in a fairly steep valley. This is the sort of view we saw a lot of today. 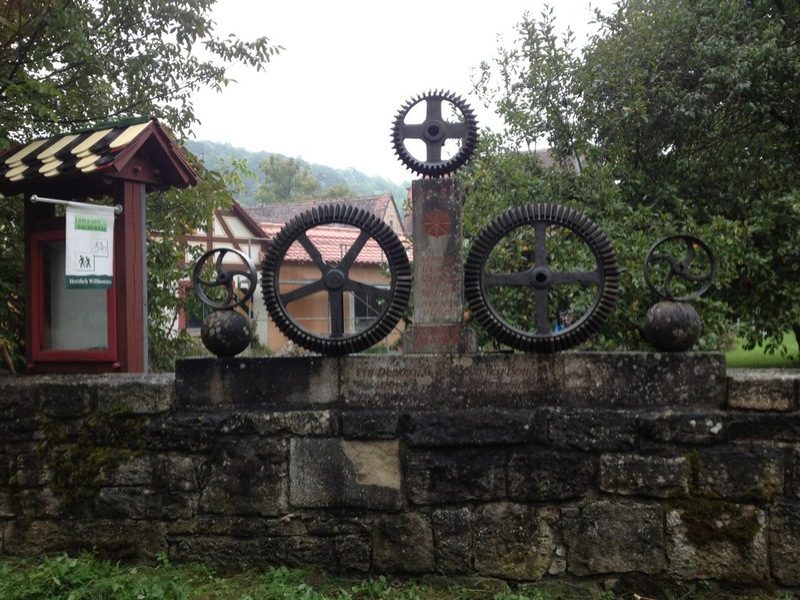 As we crossed a little river tributary at Schwarzenmühle we saw this memorial to those who have worked as millers and have died. You can probably see on that photo that things look a bit wet – yes, it had begun to drizzle fairly persistently. James was already wearing his waterproofs but I decided to put my waterproof jacket on at this point. We continued along the valley through Seldeneck, past Bettwar, having occasional ups and downs as the route followed the edge of the valley but sometimes had to climb a bit higher. 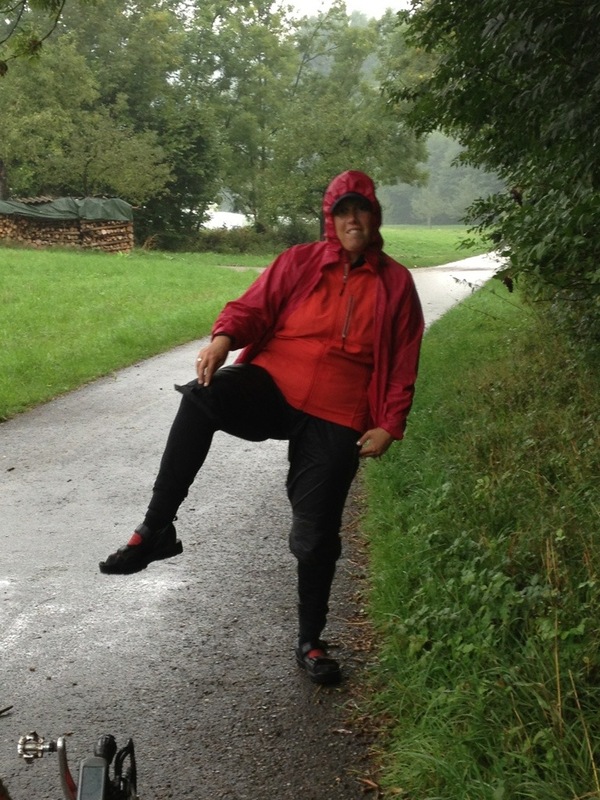 The rain started to come down a bit harder so I decided it was time to put on the Rainlegs. 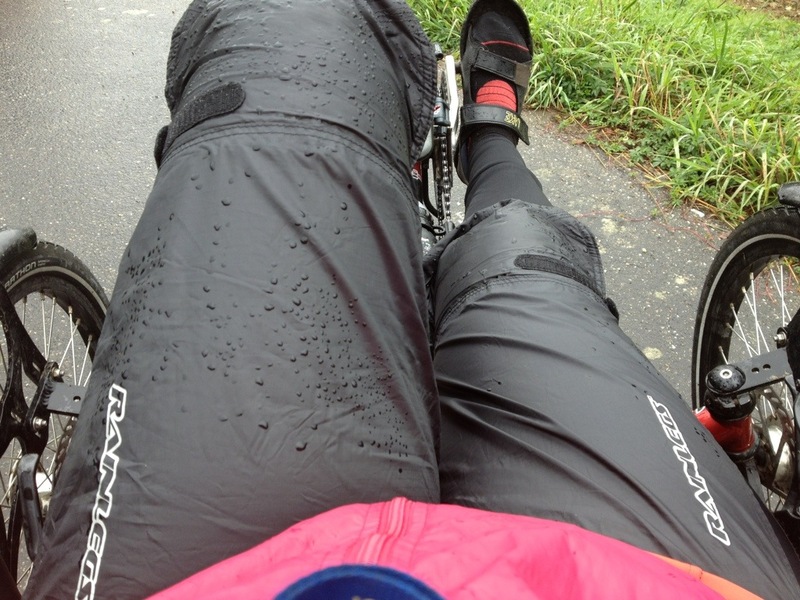 These are amazingly-uncool waterproofs which just cover the top of your legs, so you don’t sweat as much. They go just below the knee and have some very unattractive elastic straps to hold them in place. 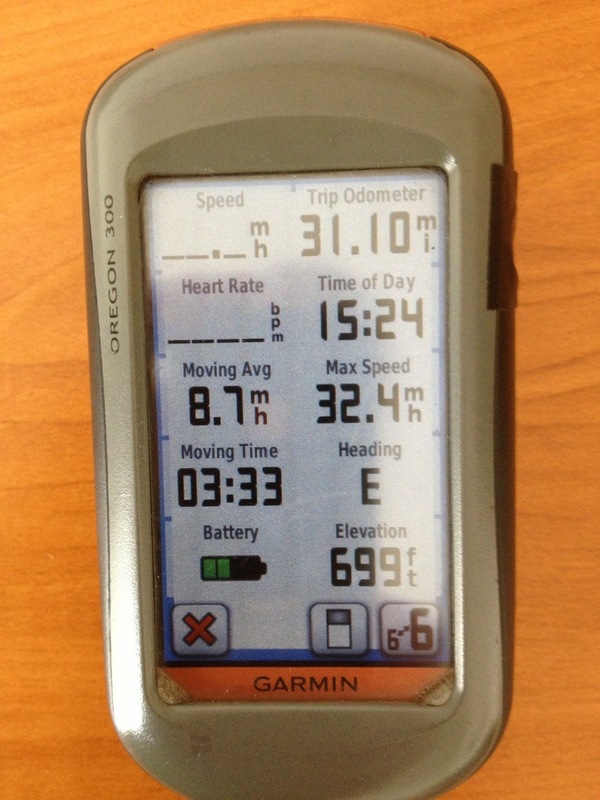 However, they work reasonably well on a recumbent. I had brought them along with me and not used them but decided today was the day for them to get their first outing in Germany! To be honest, they are pretty unromantic. We had a few fairly long uphills during this stretch which were fine on quiet roads with no traffic, just took a while in the lower gears. Here is James heading up one such hill. We spent much of today avoiding slugs on the cycle path, as in previous days when it has rained, but today I saw this rather large grasshopped too. 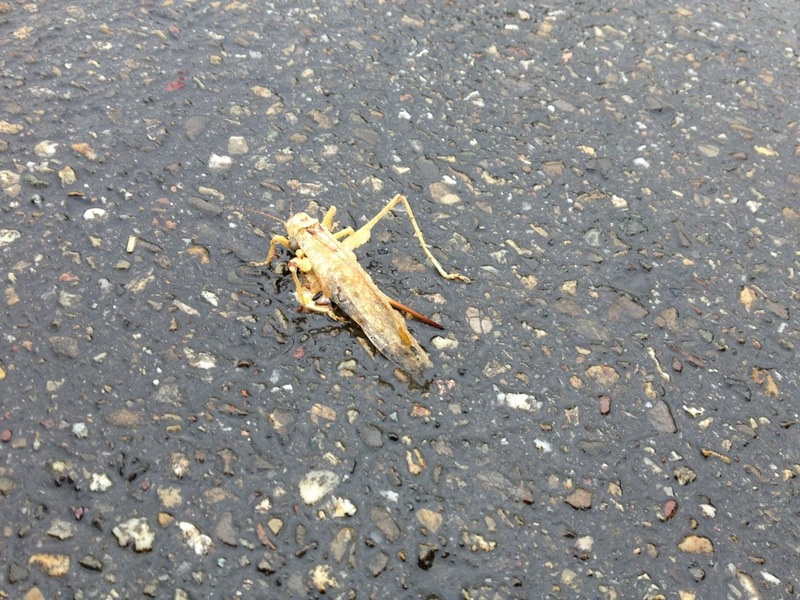 Sadly one of his legs had already been run over and I’m not sure he was still alive (didn’t move at all). The river headed a little more westwards after Tauberzell and the rain had eased off enough that James decided to take off his waterproof jacket (I kept mine on). There were still very attractive views to be had around each corner. 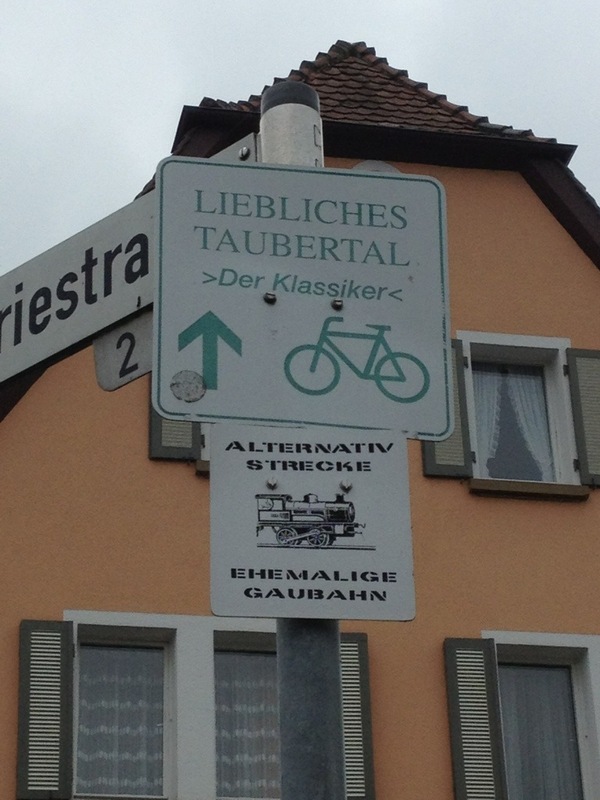 In Archshofen we noticed that we had joined another cycle route whose signs were pretty obvious – this is a wine cycling route! 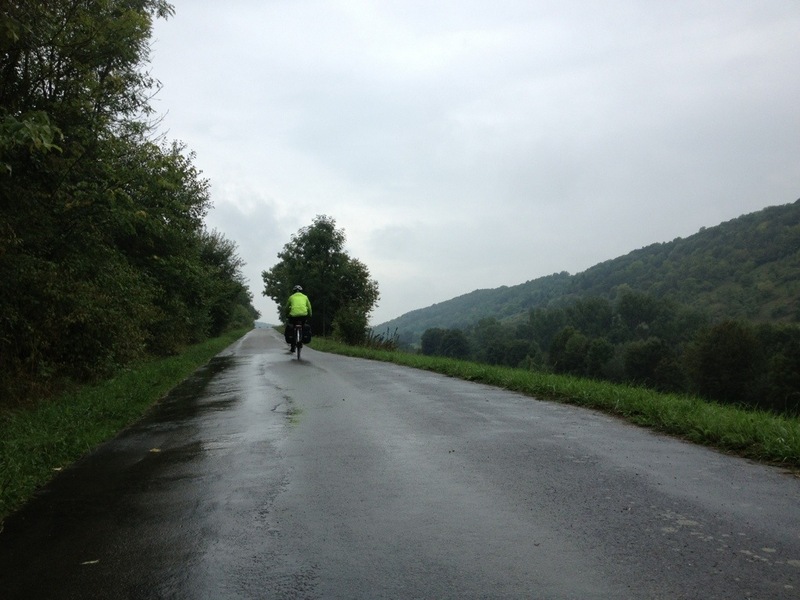 When we had earlier stopped to put on our waterproofs we’d been passed by a group of eight German cyclists. We kept passing each other as we or they stopped for breaks/photos but on the long climb up towards Creglingen we caught them up. 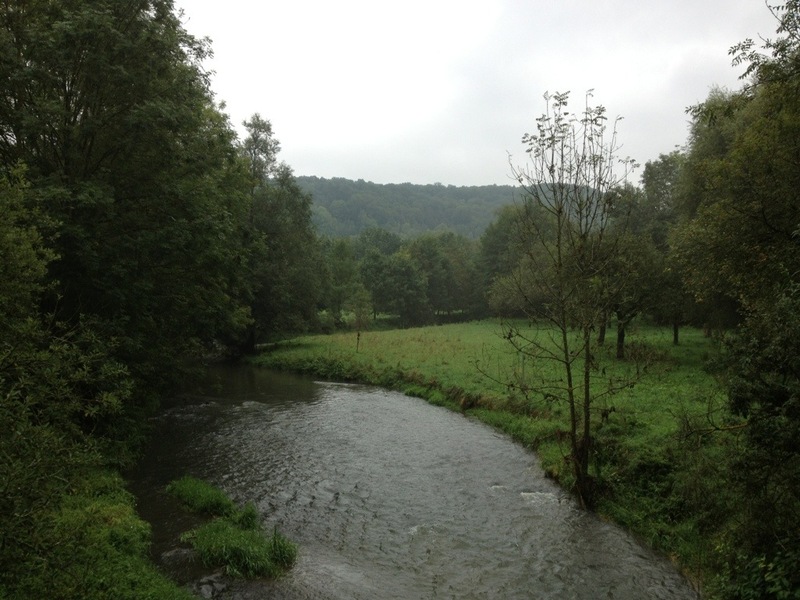 At Creglingen we crossed the river and then joined a relatively new part of the route. The English guide book talks about this route being worked on but it was clearly marked in our newer Bikeline book and the track was also on my GPS. It is a former railway line that has been turned into a cycle route between Creglingen and Bieberehren. 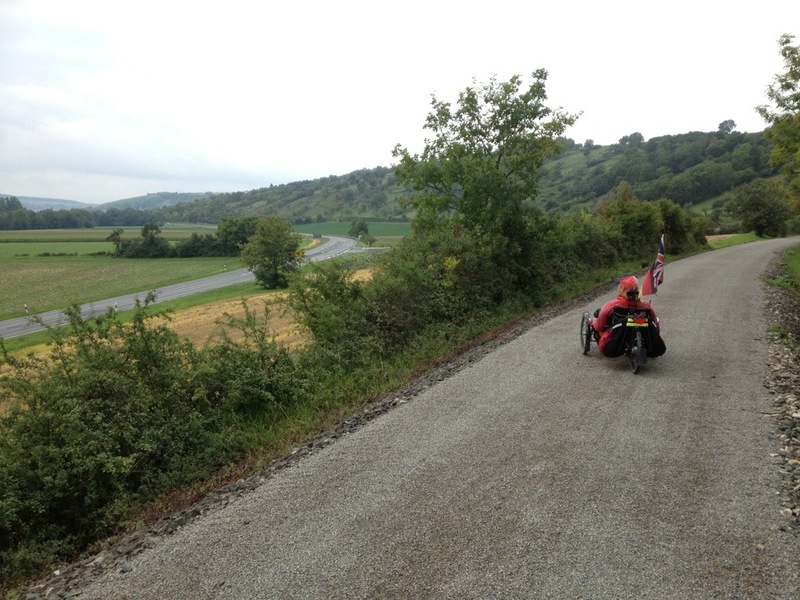 As we were about to join the route a local chap on his bike started to talk to us. 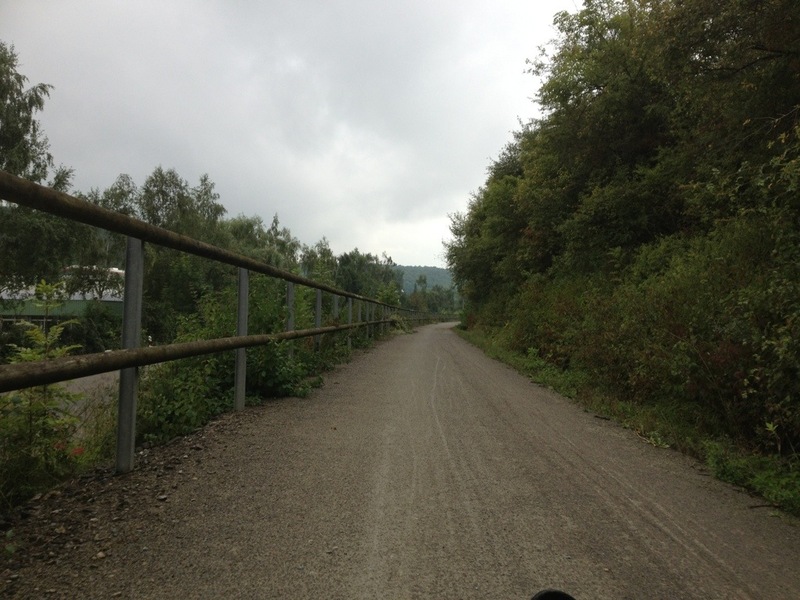 He told us that this was a very good route, that it was about 6km of gravel path but of good quality. It sounded worth trying so we headed off, weaving our way through a small industrial area before joining the path. We could see what looked like evidence of a former railway platform now just a side walkway to a large industrial building. We passed Klingen (which James initially read on the map as Klingon) and at this point realised we had crossed back from Baden Würrtemburg into Bayern (Bavaria). We hadn’t noticed the original crossing out of the county that we’d done all but a few steps (in Tyrol) of our entire cycle route so far. 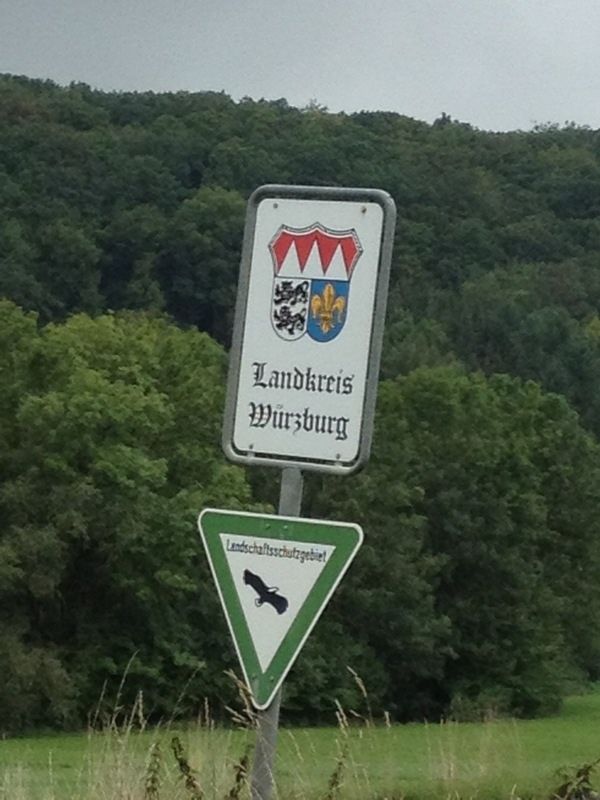 This was the only hint, a mention that we had entered the area of Würzburg. 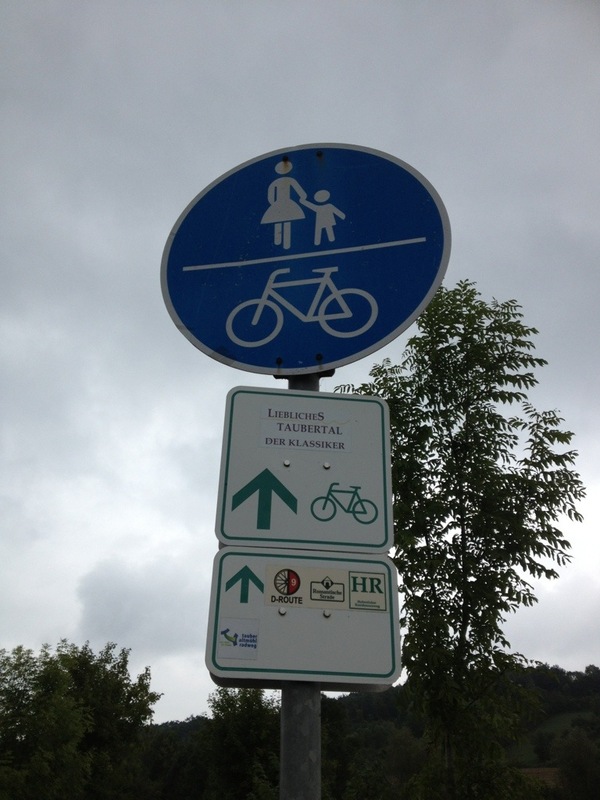 As you can see from this signpost there are a large number of different cycle routes that use this track. As we approached Bieberehren the cycle path on the old railway came very close to the river (or a narrower part of it as it split in two a little earlier). We had commented to each other that maybe this is why the railway was closed, because it must have been prone to flooding at this point, and lo and behold James noticed loads of vegetation draped on tree branches. Clearly this had flooded and various bits of vegetable debris had landedd in the trees, presumably over winter. James is showing here the height that this flotsam has reached. 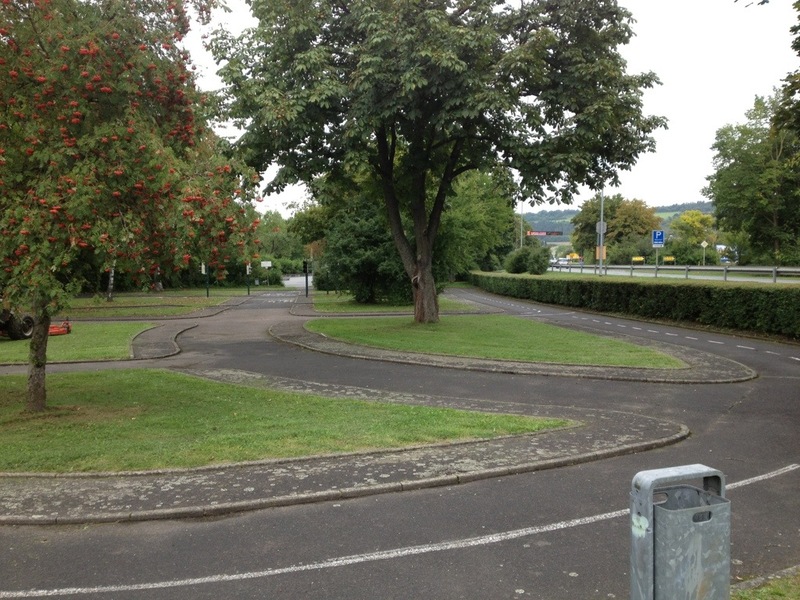 The route along the cycle path finished at Bieberehren but I noticed on my Garmin that there was a very decent ‘Bicycle Path’ marked that looked like the continuation of this railway, although the official Romantische Straße route used roads on the other side of the river. We decided to give the Garmin route a go, so in Bieberehren we left the official track and worked our way slightly northwards. 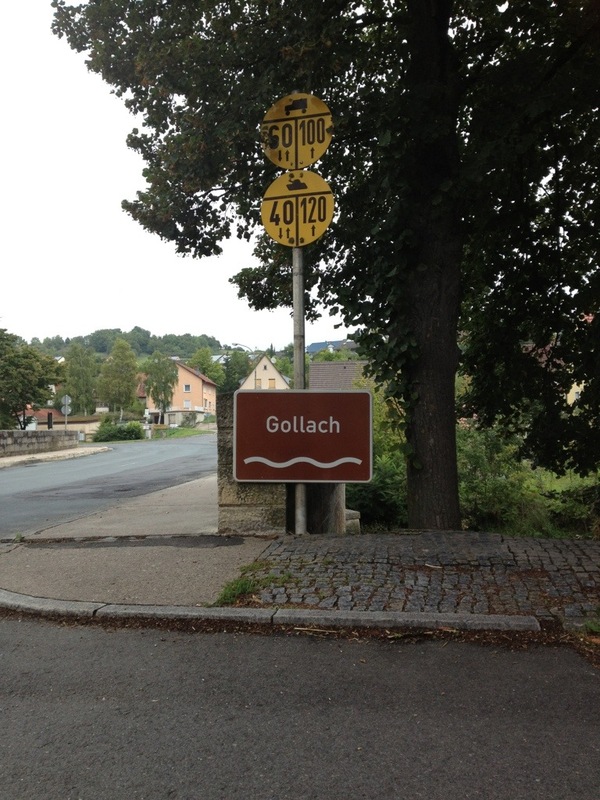 We crossed one of the Tauber tributaries, the Gollach, on the way. They obviously haven’t quite prettified this section up yet as we had to cycle along past an old car lot with various damaged manky ancient cars. If it weren’t for the Garmin map we would have had no idea the railway had come along here. 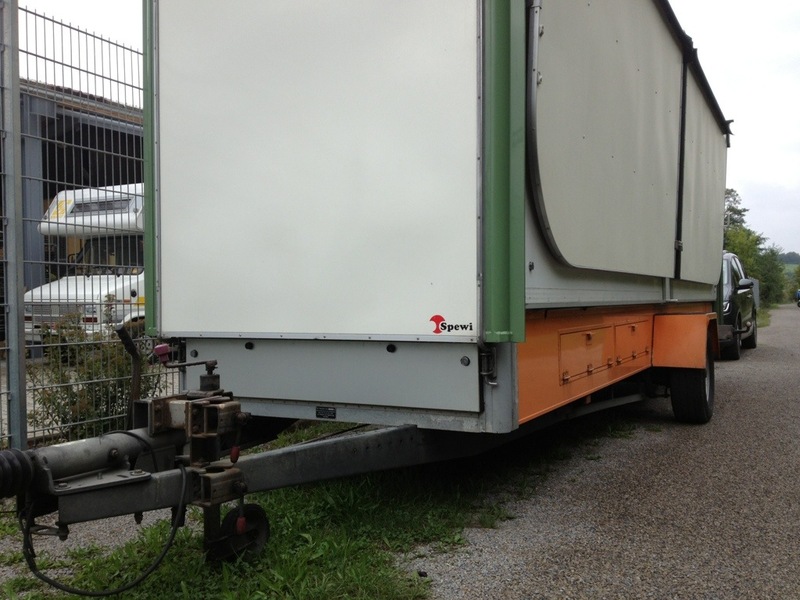 I photographed this unfortunately-labelled trailer – “spewi”!!! 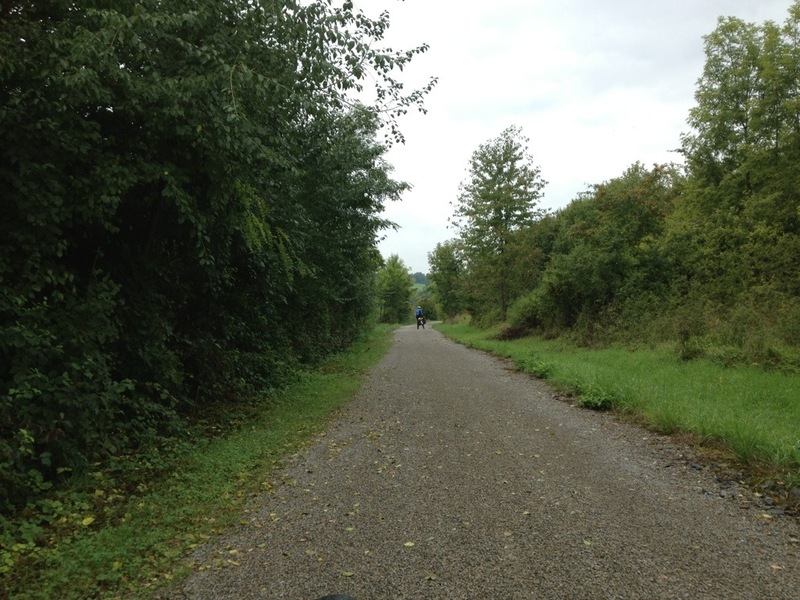 We were back on the nice cycle path with a decent gravel surface which we could progress along comfortably at 11mph. 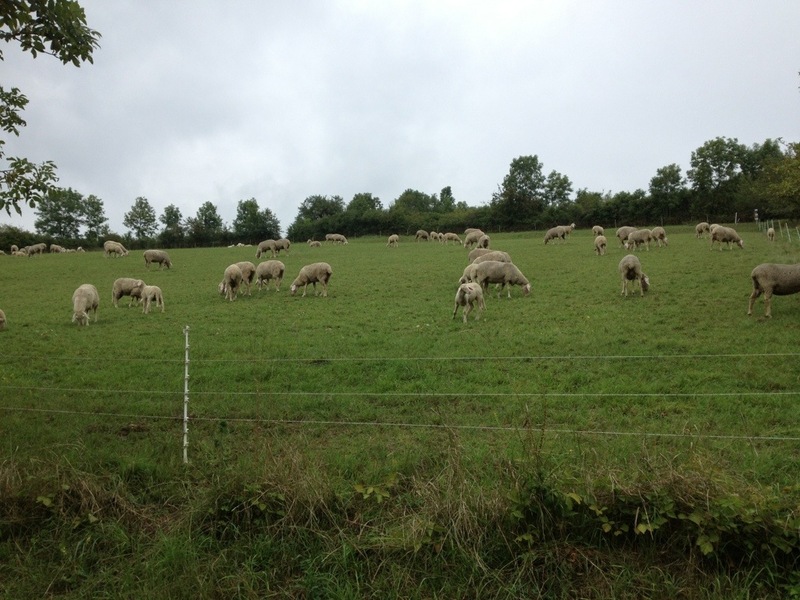 We passed this field of very inquisitive sheep and very large lambs. The route described a fairly large curve with the main road below us. 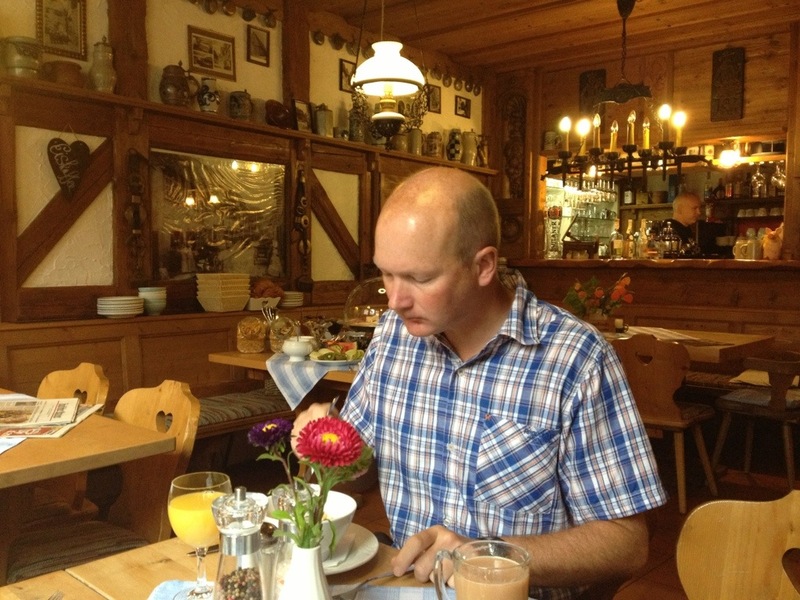 Here am I contemplating lunch at Röttingen, just three kilometres away at this point. It was dry enough now that I had removed my waterproof jacket. 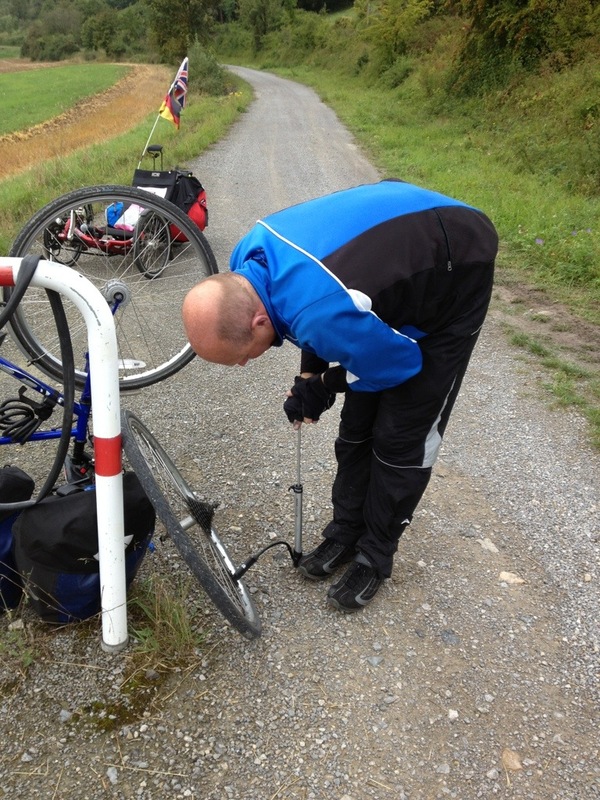 Then just after we had crossed a side road James called out that he had a puncture. 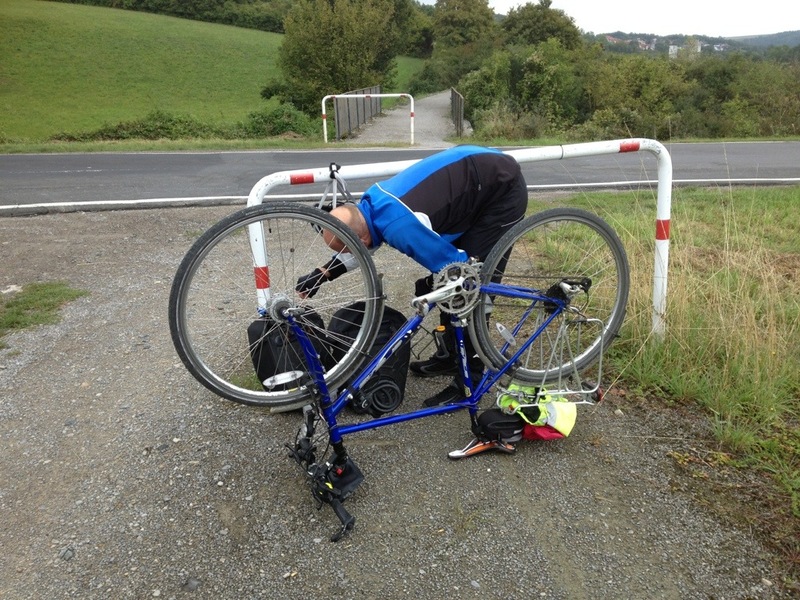 This was about one minute after I had been saying to myself that once again I hadn’t had a single mechanical issue or puncture on a German cycle tour (I haven’t had any issues on my German tours for several years). 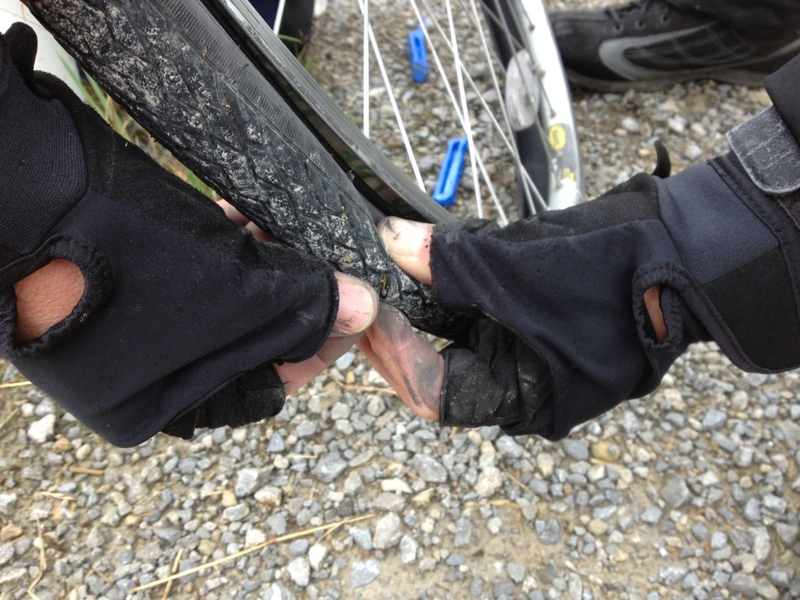 He’s used to fixing punctures so made quick work of it. A very large piece of glass was embedded in the tyre and had cut a very impressive slash in the rubber. This tyre will be replaced when we get home. James borrowed my new Topeak Mountain Morph pump to pump up the new tube (the pump is excellent, by the way, easy to use by a one-handed lady and gets the tyre up to decent pressure without too much effort). 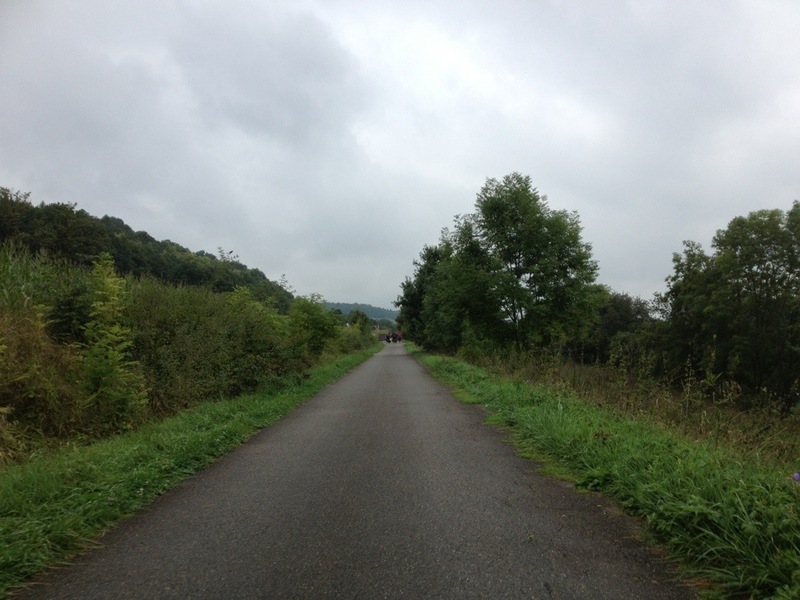 The clouds were gathering during the ten minutes we stopped to fix James’s puncture and there were a few spots of rain as we rolled into Röttingen. 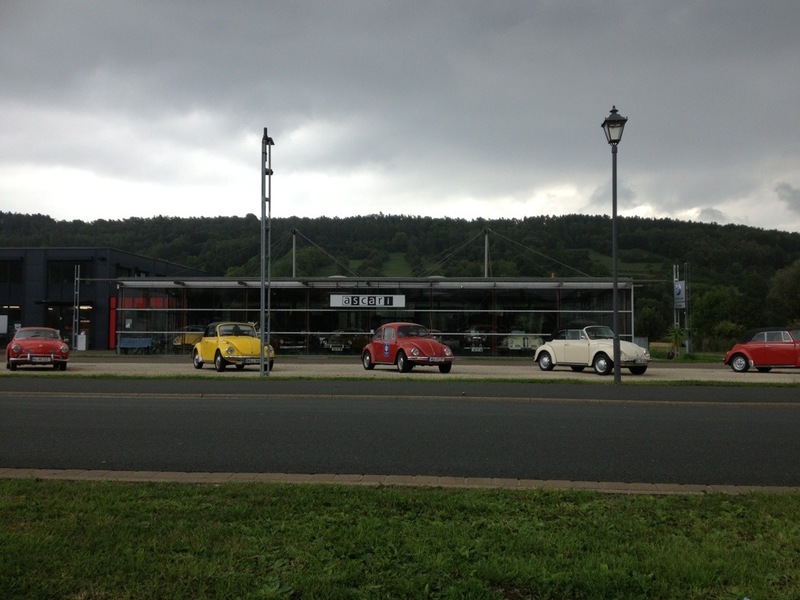 We passed this garage which had an interesting selection of cars outside. 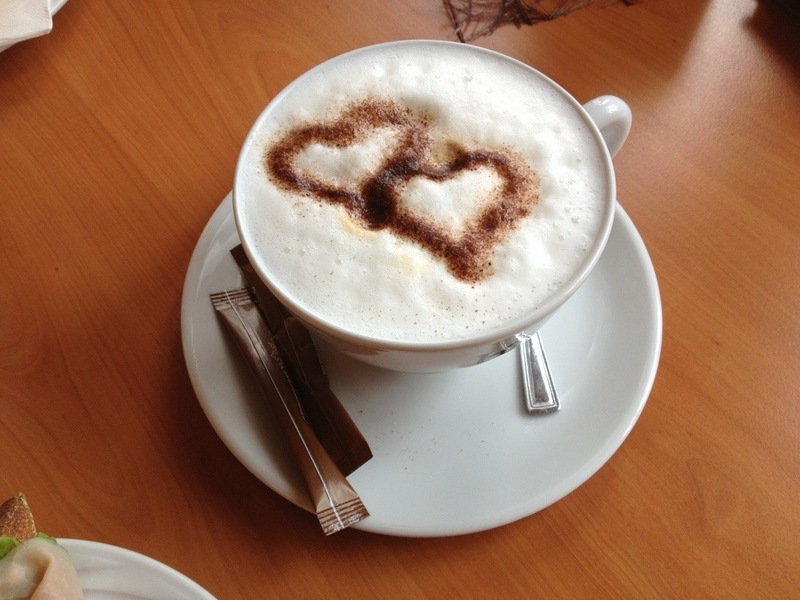 James ordered a cappuccino which came with a rather romantic decoration! 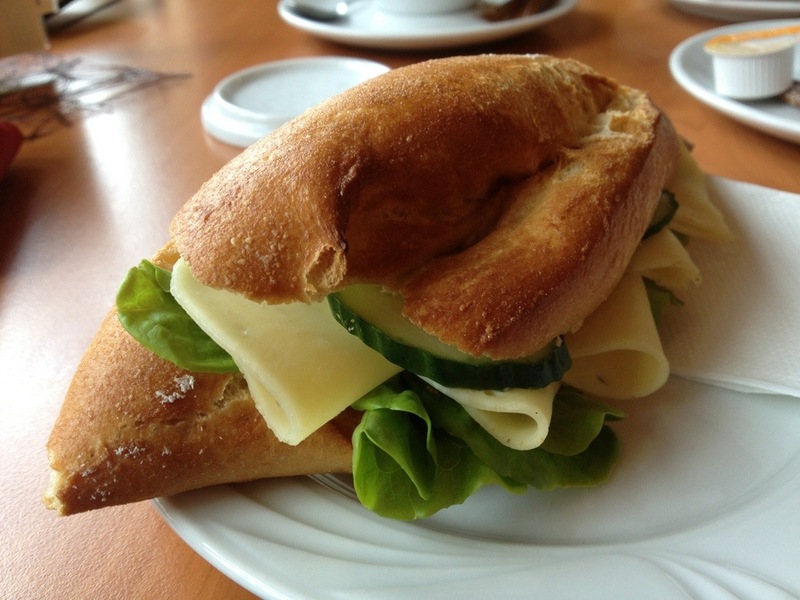 I had a cheese roll with my cup of tea. 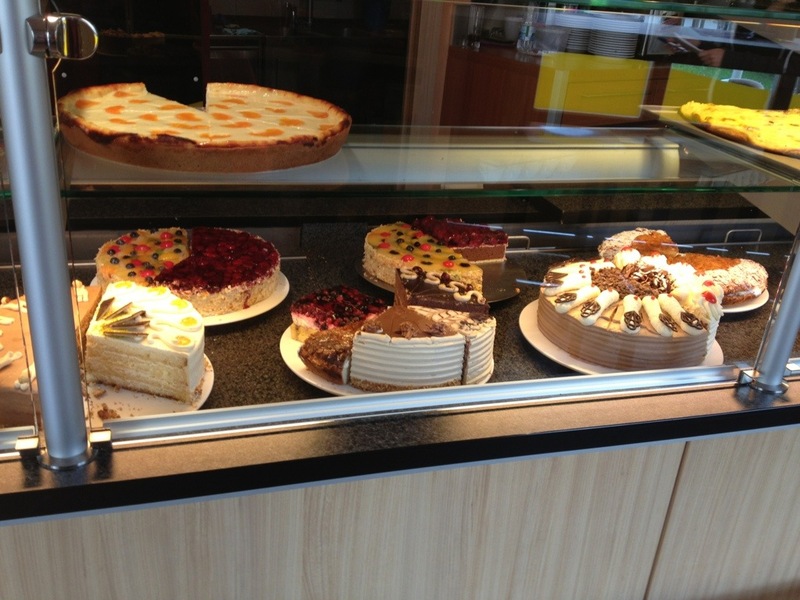 They had a nice selection of cakes. 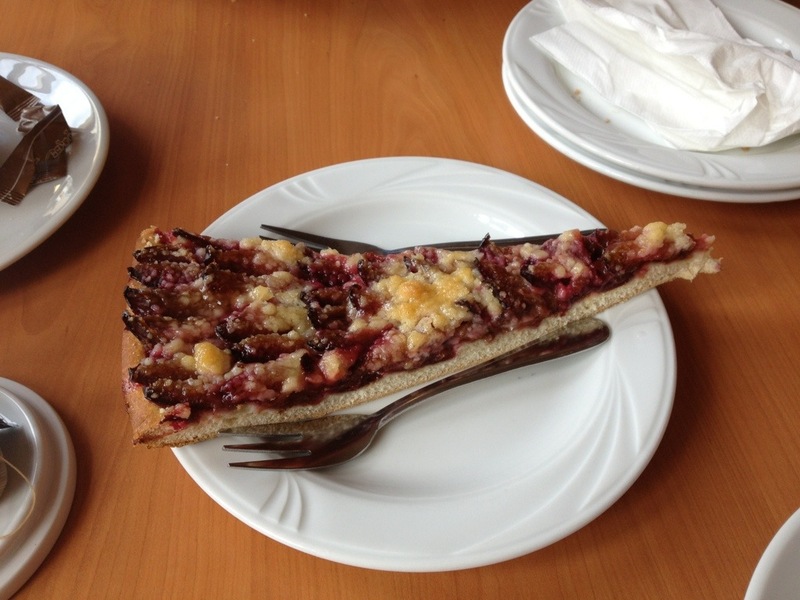 But we decided to choose something local – it looked a bit like a pizza but was either a plum cake or a cheesecake. 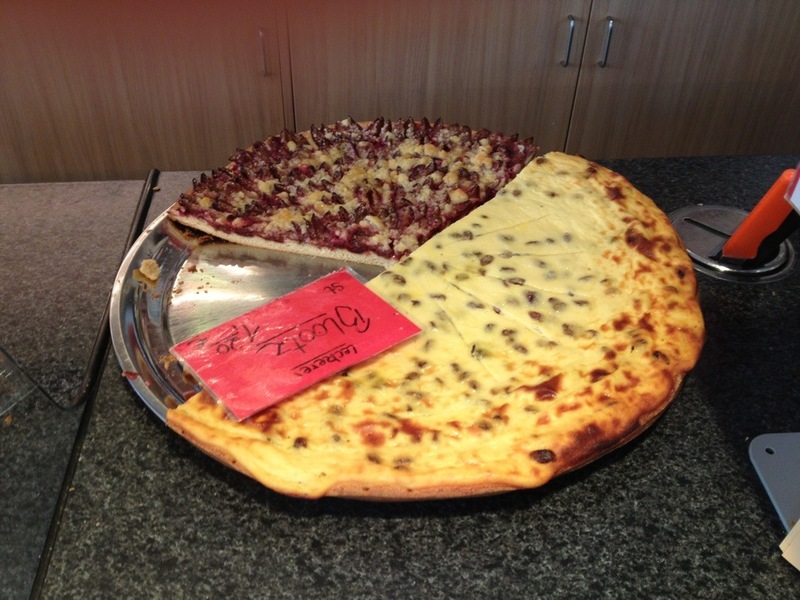 I went for plum, which we shared. I noticed that there were no Schneeballen in this bakery so obviously we had gone beyond the reach of Rothenburg’s speciality. There were two American ladies in the bakery when we arrived (I walked in on one in the ladies’ loo as she hadn’t locked the door, and she seemed very put out that I opened it but I had no idea it was in use!) and another English-speaking couple bought some food whilst we were there. When we went outside this couple struck up a conversation with us about our ride – it turned out they were Aussies obviously over here for a reasonably long holiday and they were really enjoying their time in Germany. They were off to London next. 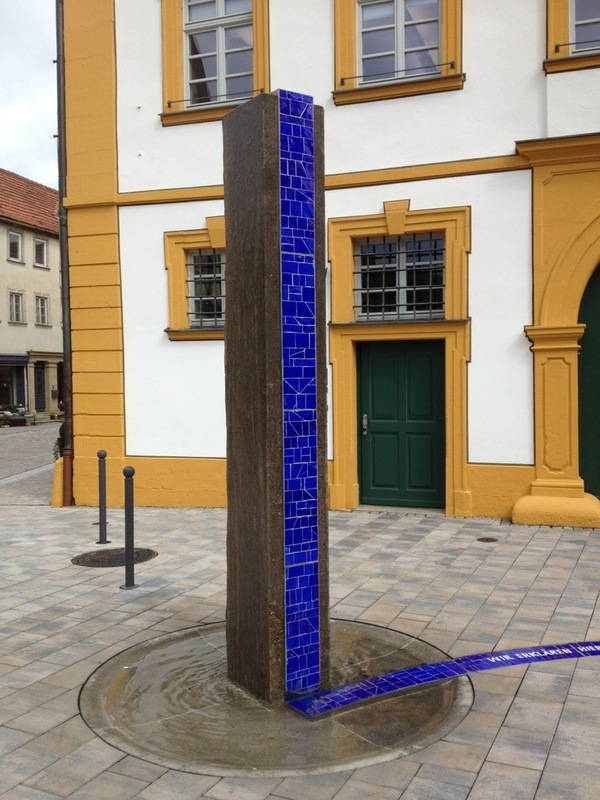 Röttingen had this weird sculpture thing. Which continued the other side of another large chunk of stone. 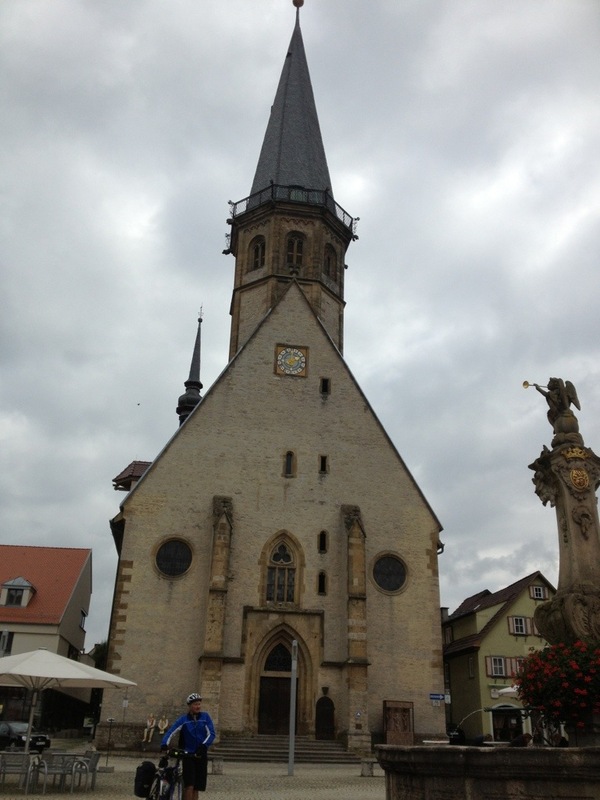 We headed out from Röttingen with only 13 miles to our destination, Bad Mergentheim. The rain had stopped again whilst we were in the bakery and the vista opened out to a flatter valley for this section, once again on the left hand side (south bank now) of the river. 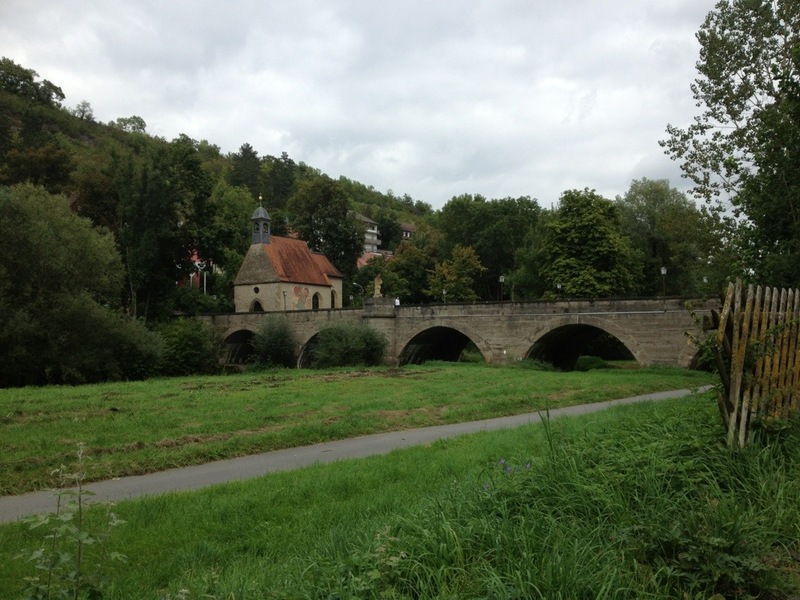 At Tauberrettersheim we stopped to photograph the bridge, unsurprisingly called the Tauberbrücke. 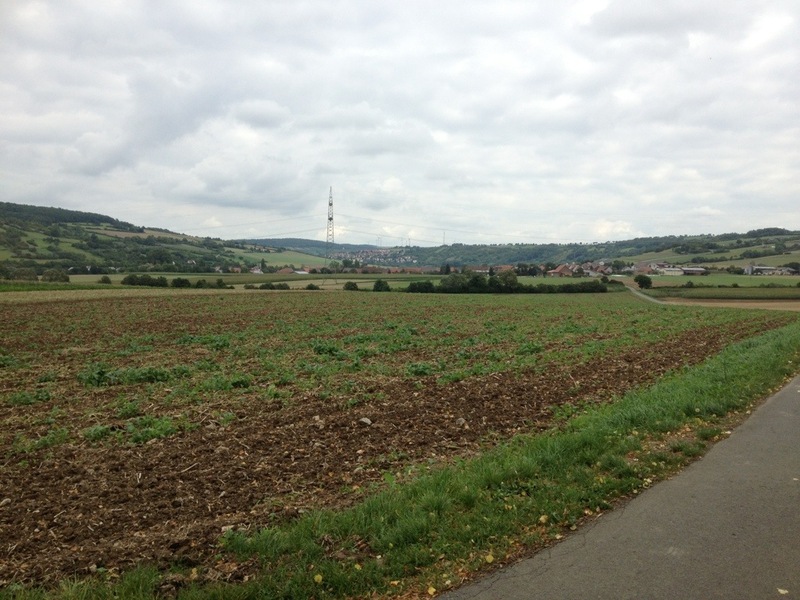 We were now heading towards Weikersheim and as we approached the town we spotted a bike shop right alongside the route. I’d wanted to replace my water bottle with another one with a double cap (to keep muck off the mouthpiece) so stopped to have a look. A very nice lady said hello to us and I asked to see the water bottles. Unfortunately they didn’t have the type that I need (they’re quite hard to get hold of), but we had a nice chat anyway. The lady, Rita, was amazingly friendly and talked to us loads about the people who have dropped in on her shop on the way from London to Istanbul, for example. 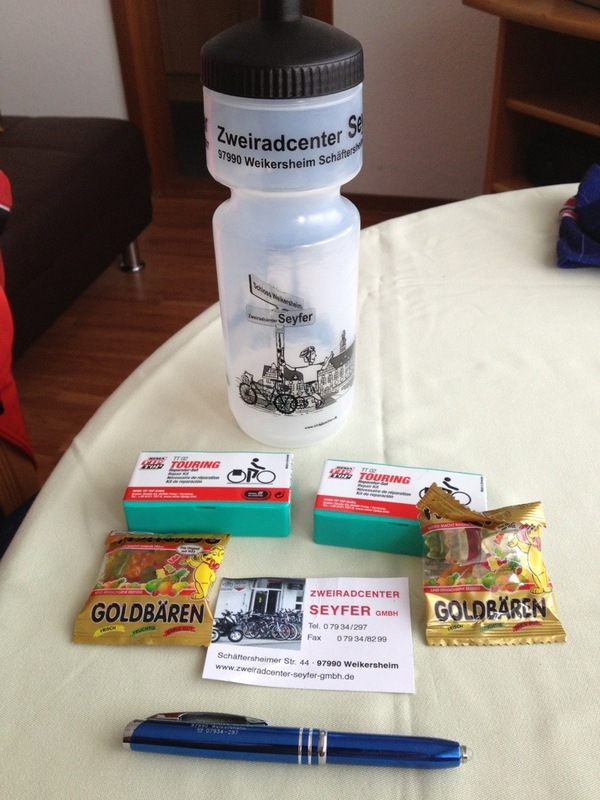 She kept also giving us free gifts – initially a bag of Haribo each. We talked a bit more and she gave us a pen with the bicycle shop name on which had a surprisingly bright torch light at one end. 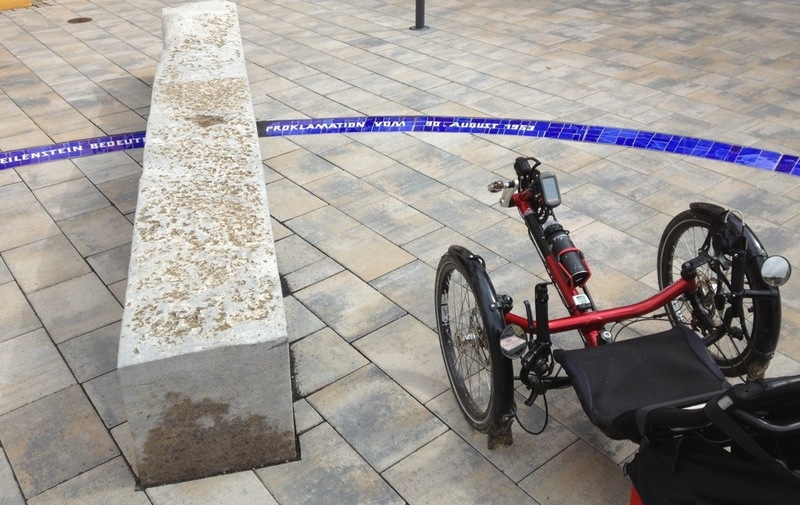 We talked some more (had a look at her selection of different Schwalbe tyres, most of which we don’t really see in the UK) and she asked if we’d had any punctures. I said that James had just had one so she gave us each a puncture repair kit. 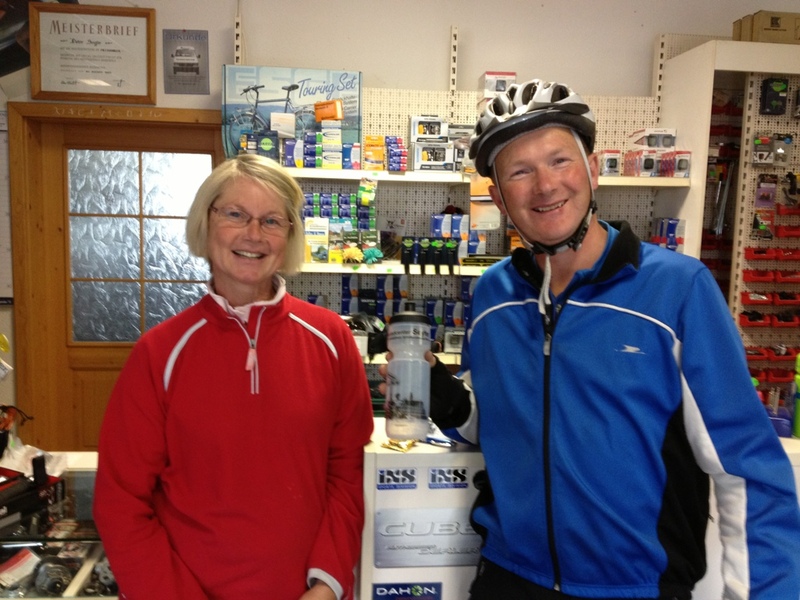 We were suitably grateful, she was being really generous (especially as we hadn’t bought anything), but we were having a great conversation and she was very interested in the fact we lived in Essex as she knew of other cyclists from there. Anyway, to top it all she gave James a free water bottle! She was happy to have a photo taken of her with James and the pile of goodies between them. 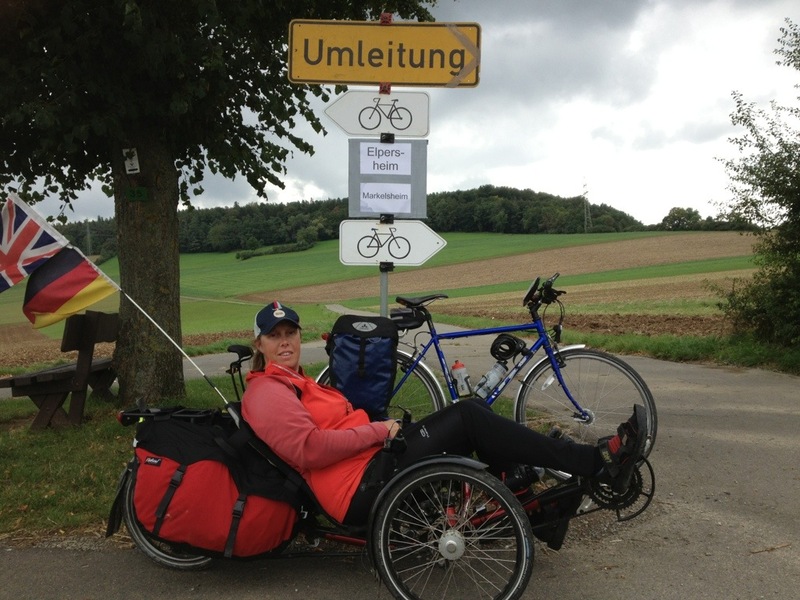 We can heartily recommend Zweiradcenter Seyfer at Schäftersheimer Straße 44, 97990 Weikersheim, if you need anything for your bike (it was a huge shop) or just want a chat with super-friendly Rita! She requested that we send her a proper postcard from Essex so we’ll do that when we get home. We’d spent probably twenty minutes talking with Rita but she was great fun and it gave us a real boost to meet someone so thrilled to talk to travelling cyclists. 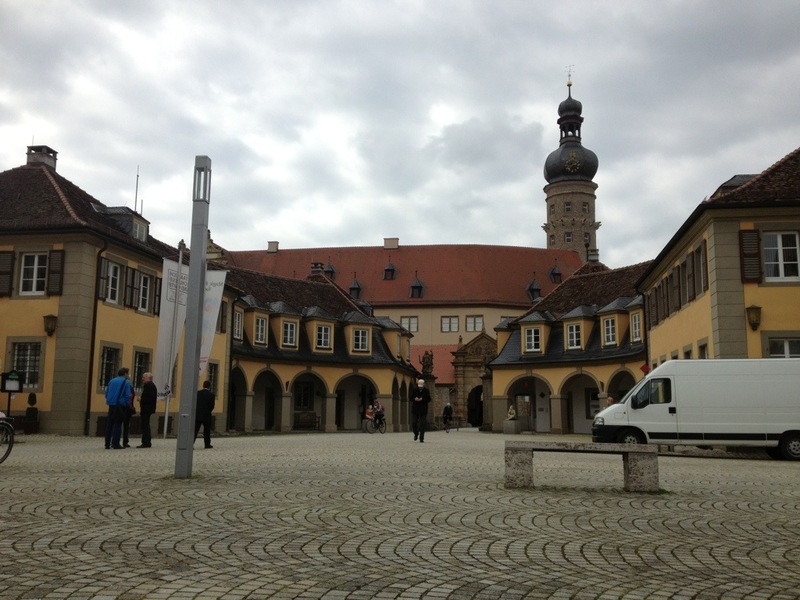 After a few hundred metres further cycling we reached the central square of Weikersheim with Schloss Weikersheim which looked very posh. From here we headed off out into the countryside again, following the Tauber. 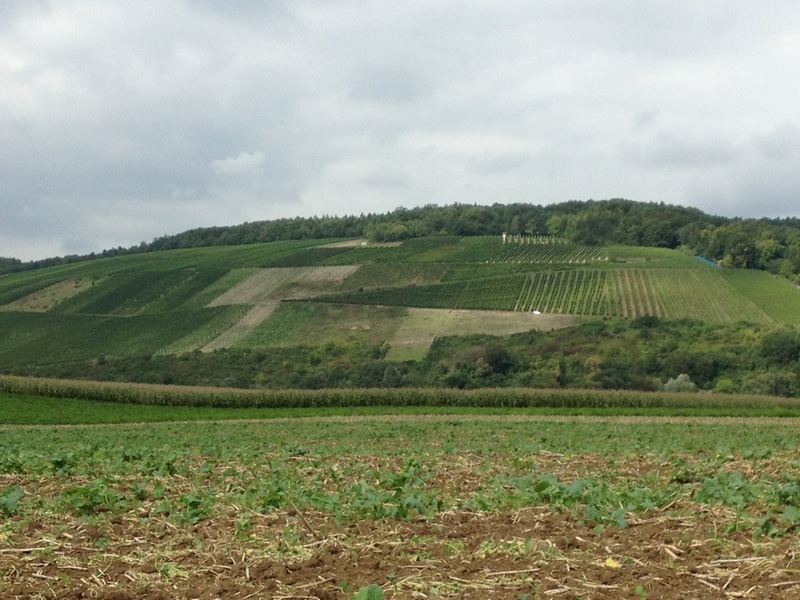 The landscape was getting more varied with not just sweetcorn and grass growing but the first big sections with vines. 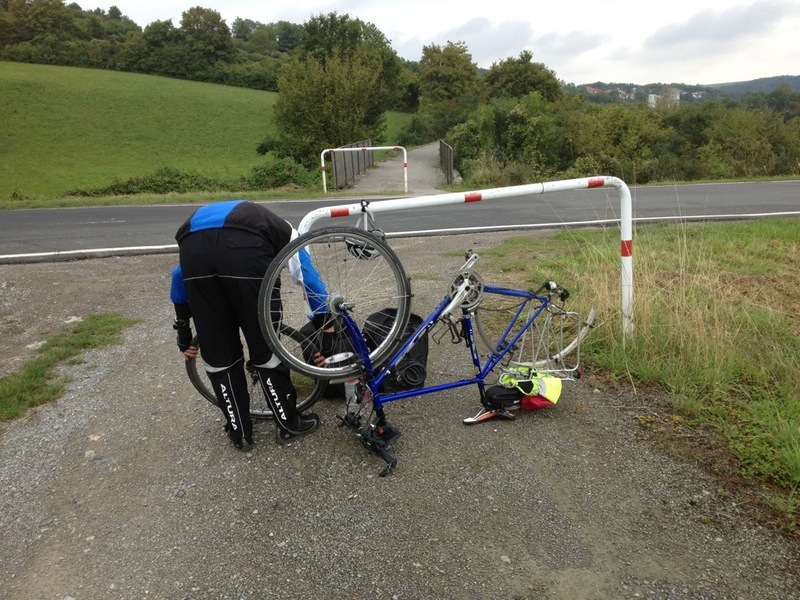 At Elpersheim we came across a very obvious diversion for bikes which kept us on the south side of the river rather than crossing and riding along the other side, the route that the book and the Garmin had. This turned out to be a very decent diversion with a good asphalt surface although it was quite hilly, including what was probably the steepest short climb we had to do. We got more good views across fields to the valley edges from the top. 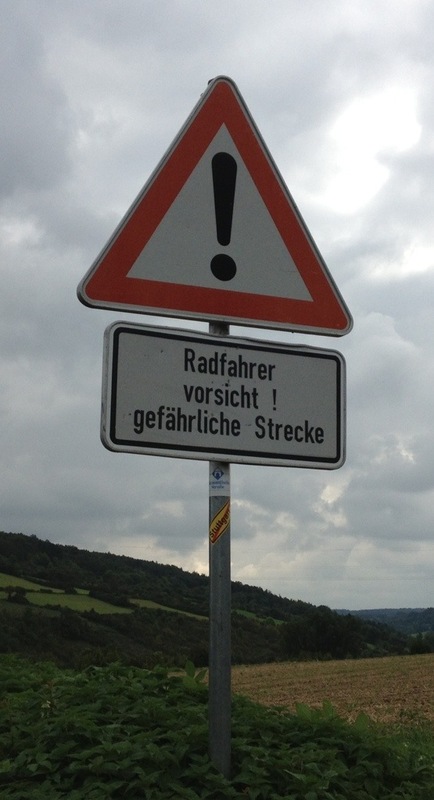 But also a warning about the dangerous section we’d just ridden. It didn’t seem dangerous at the time! We have spent a lot of time today cycling past apple trees with loads of orchards on the route. 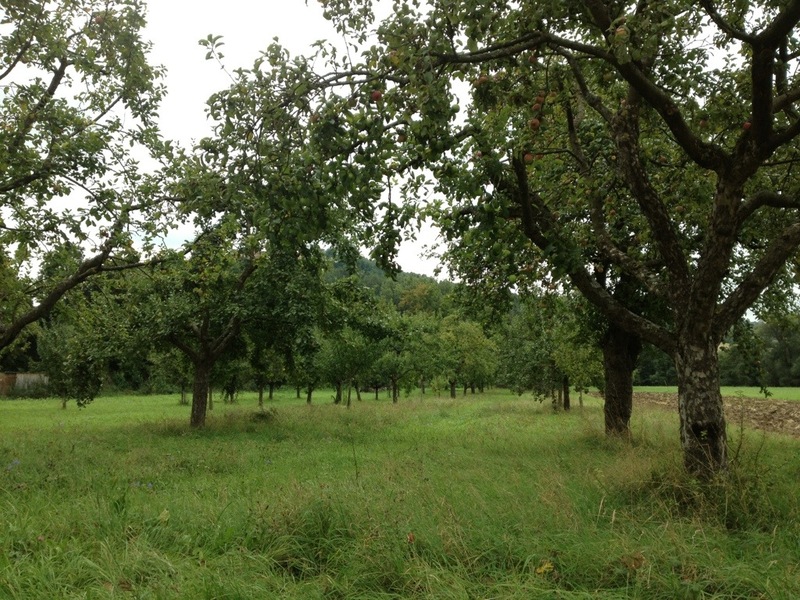 Here’s a picture of an orchard we saw just after Markelsheim where we rejoined the official route. 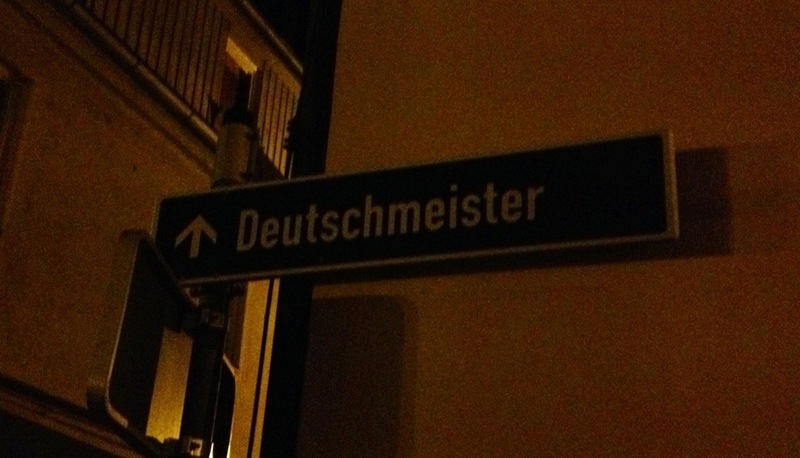 In Markelsheim we also passed the winery that made James’s last night’s drink. Fortunately/unfortunately it didn’t look open today. 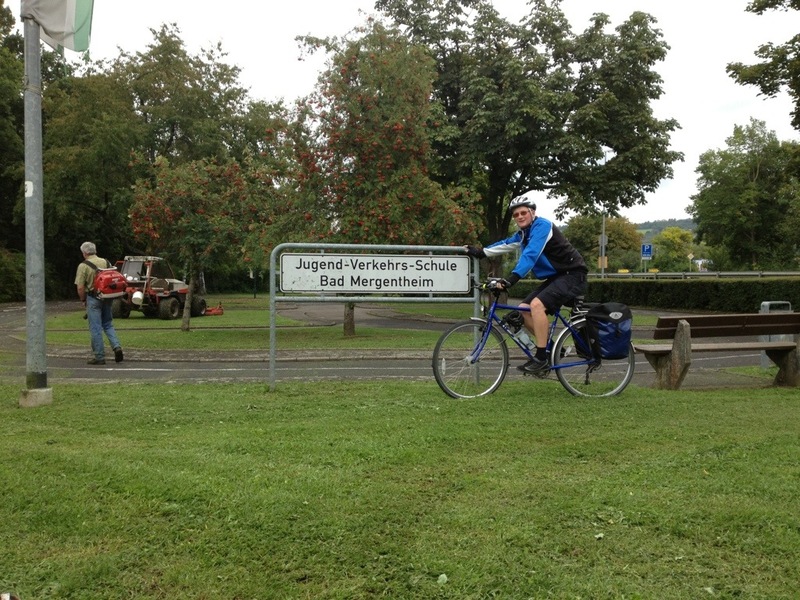 We were on the final stretch now and rode through Igersheim before crossing over the river to the north bank and heading in to Bad Mergentheim. It’s an interesting spa town as it has a large area where bikes aren’t allowed so we had to do a bit of a detour. 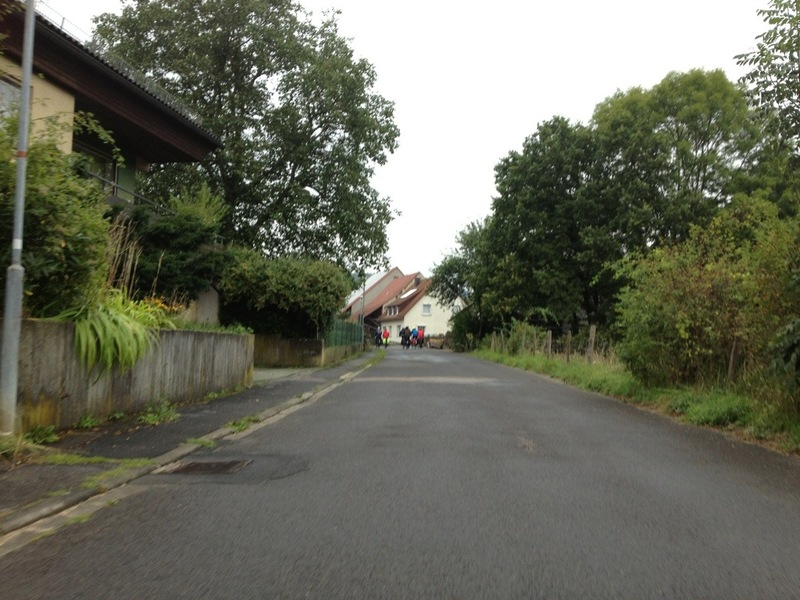 We passed an unusual area of path – it is a cycle school. Here is James the Bikeability Instructor posing next to it. It’s a series of roads with markings and even traffic lights but just bicycle path width, presumably to train young German cyclists on the rules of the road with no cars actually there. 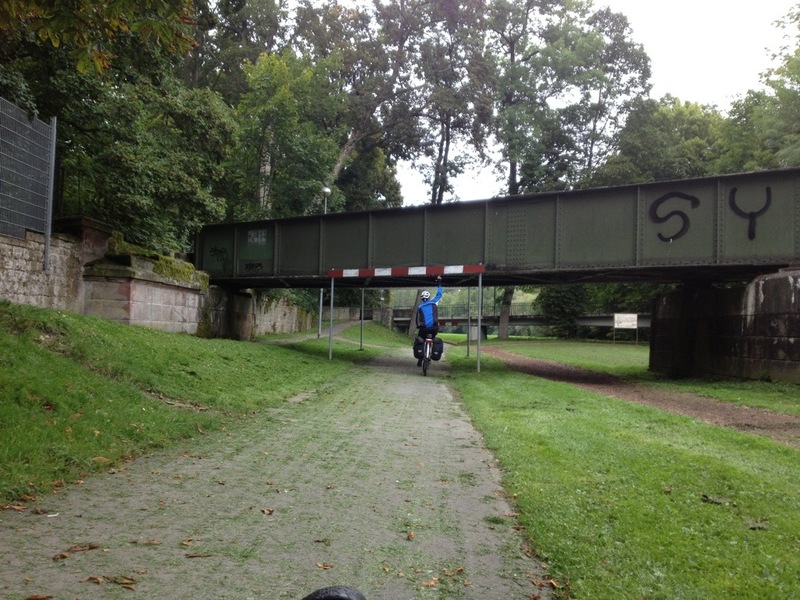 We then headed towards the bridge over the Tauber that we needed to take for our hotel, first passing under a railway bridge which had height markers for cyclists! 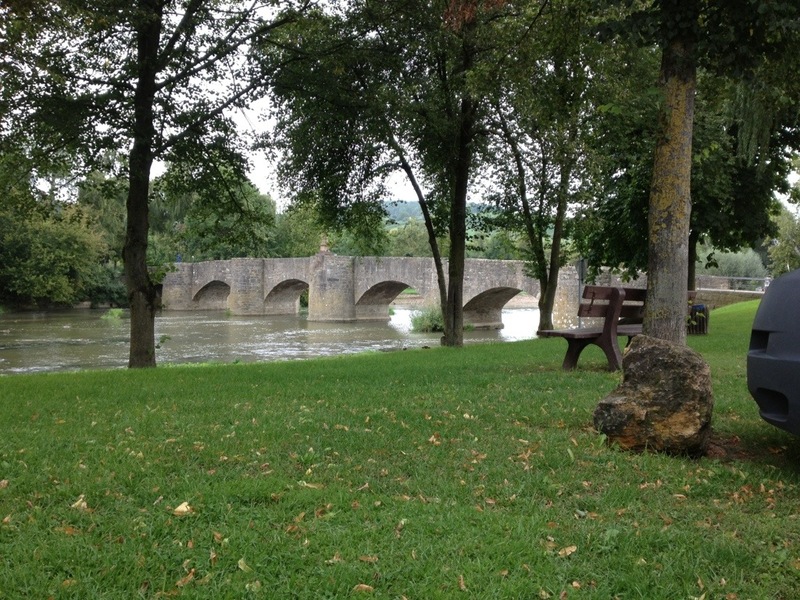 We reached the Wolfgang Bridge with the Wolfgangskapelle at the northern end. 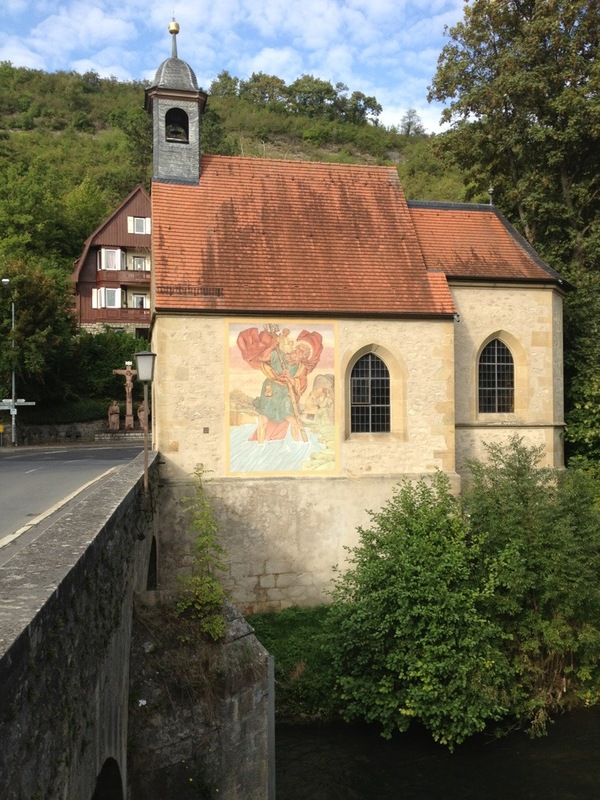 There’s a mural of St Christopher on the side. Our hotel was just 100 metres along the road and we found it easily enough. I went to check in and all went fine – the lady told us that we were actually staying in a different building, the annexe, and this turned out to be a different Guesthouse about 50 metres further along the road. Clearly Hotel Wanfried have taken this building over as it had a reception desk and all sorts of things to show it used to be a self-contained hotel but there were no staff there. My Booking Reservation had warned us we would be in a different building so this wasn’t a surprise, but the room itself was – it turned out to be a Ferienwohnung (holiday apartment) rather than hotel room so was huge and had a fully-functioning kitchen, including kettle! 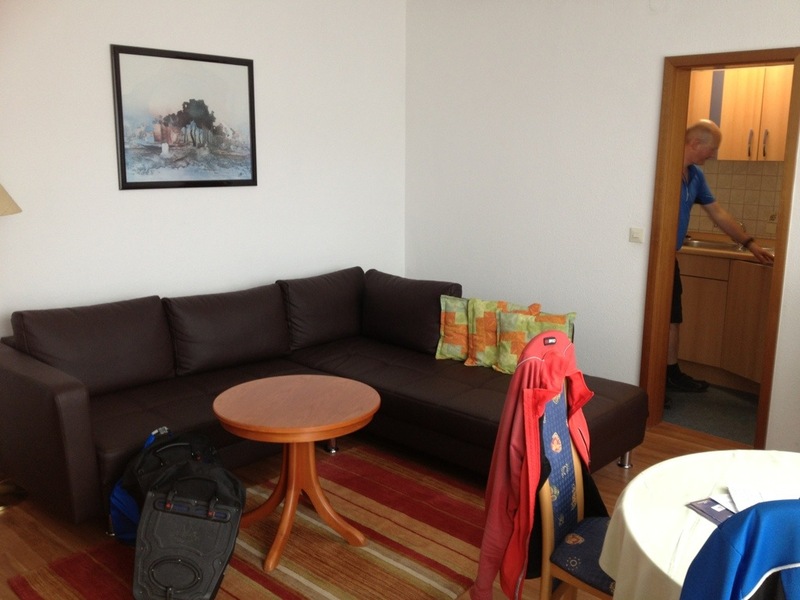 We have a lounge area with large sofas, balcony and attached kitchen. And a large and comfy bedroom with separate balcony and en-suite. All this for a very reasonable price, and breakfast served in the main hotel tomorrow morning (so we’ll have a short walk for our food). The Internet connection was pretty decent too. We went out for a short walk to the supermarket to get some milk for our cups of tea and a few nibbles as it was too early for dinner but we were hungry. After writing up most of this blog (as well as doing all the clothes washing etc) it was time to head out for our main meal in the Altstadt. 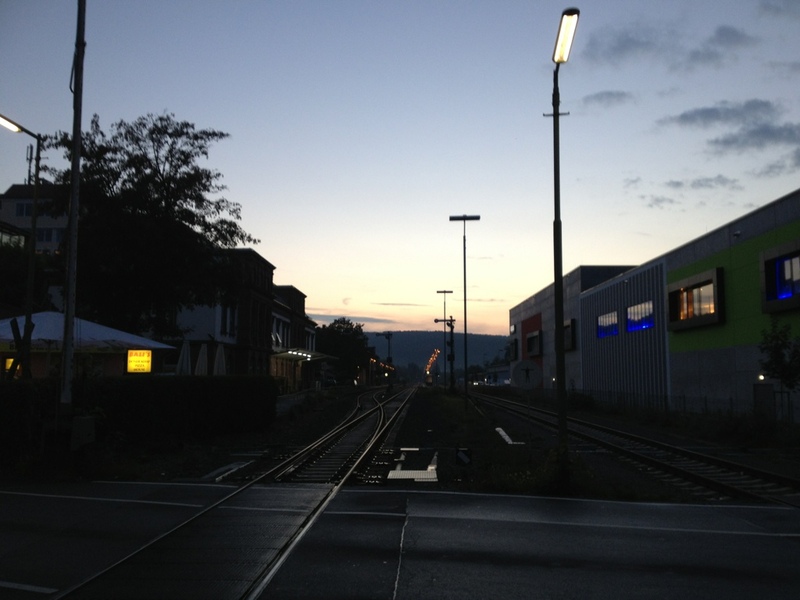 We crossed the railway line to get into the town. Note the lack of any barriers etc to prevent idiots playing on the railway – I suppose they assume you’ll be sensible about it. We walked into the town centre and saw the attractive buildings (the twins), connected by a gate/porch (on the right hand side). A view of the pedestrian precinct at dusk. 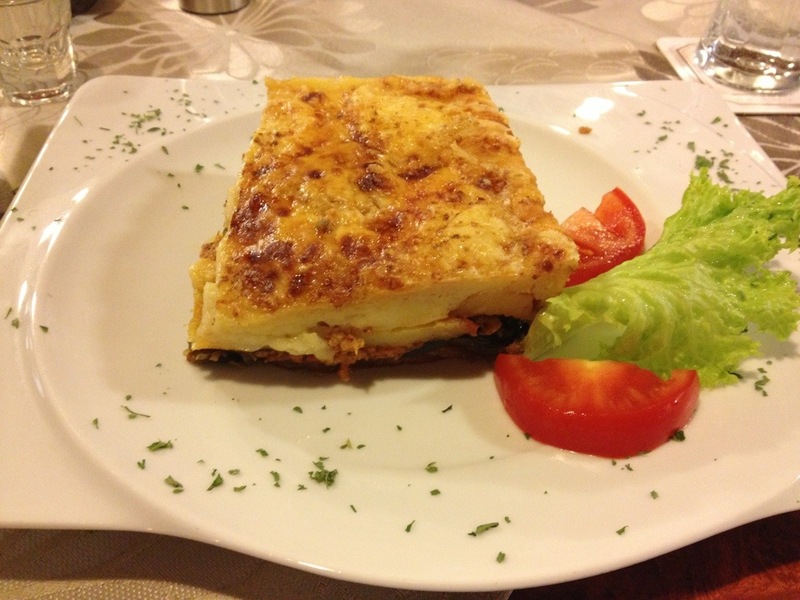 We found a Greek Restaurant that looked rather nice. 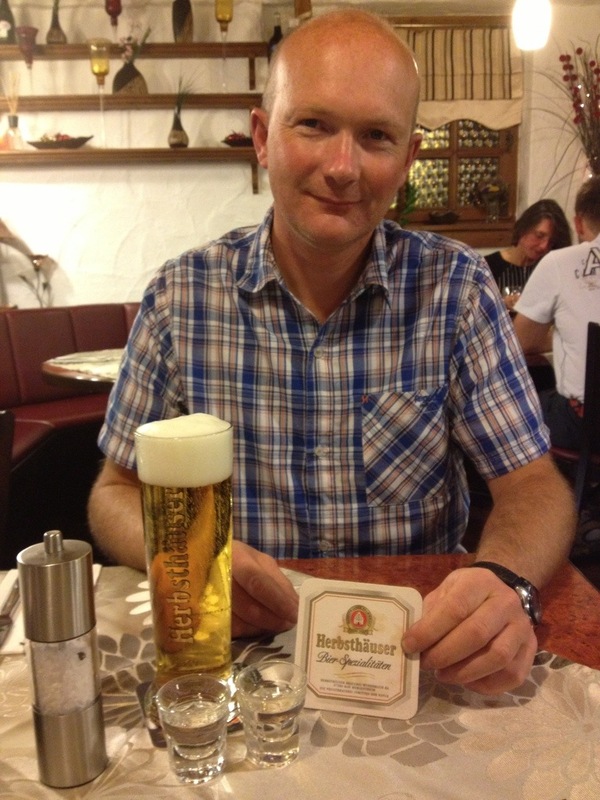 James ordered his usual beer and me some tapwater (cheapskate). 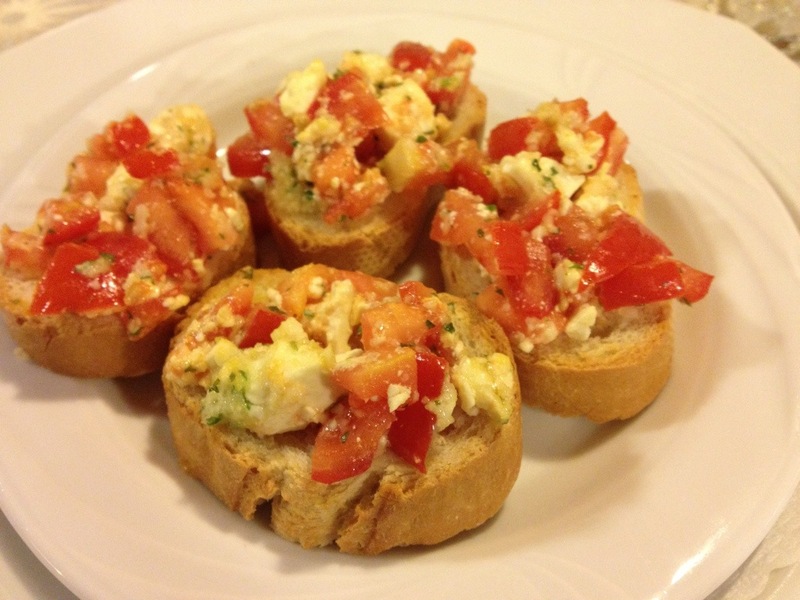 James did well out of this as they provided us with two glasses of Ouzo and he had both! 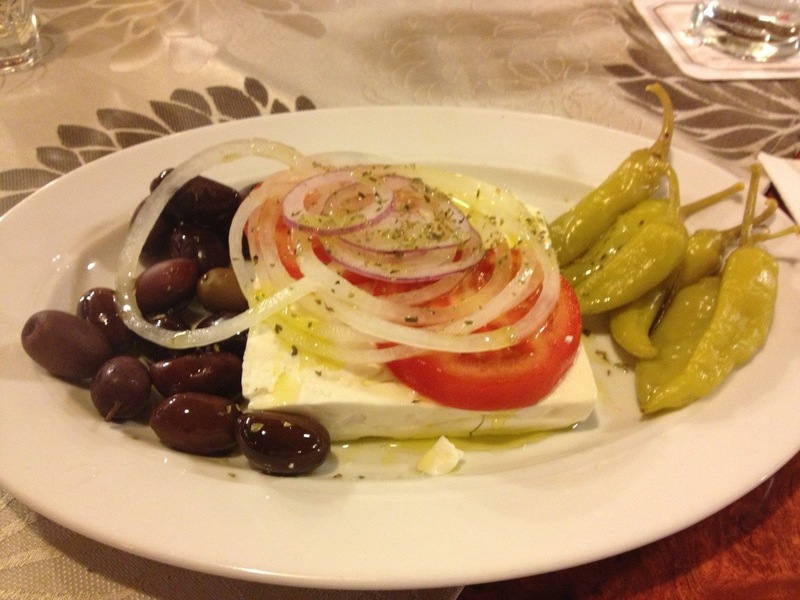 I ordered a starter of Sheep’s Cheese – it was enormous! 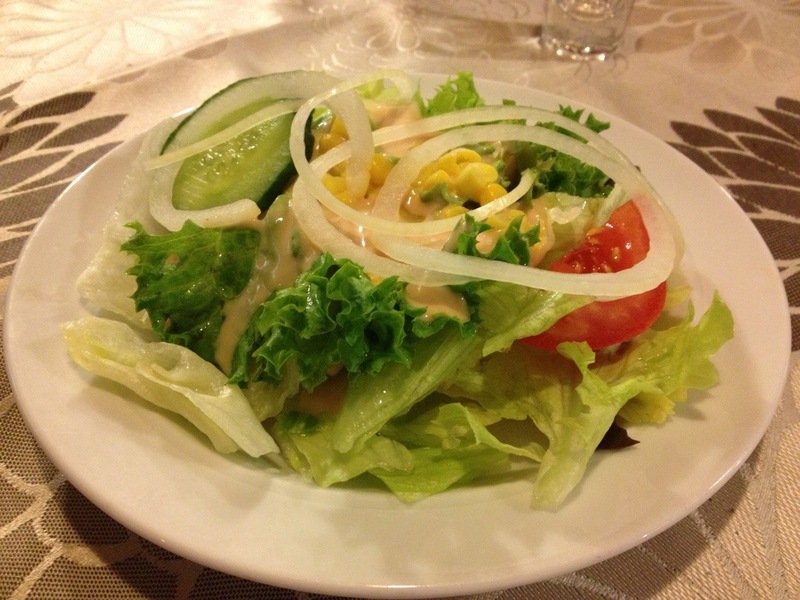 This is the salad that came with my moussaka. 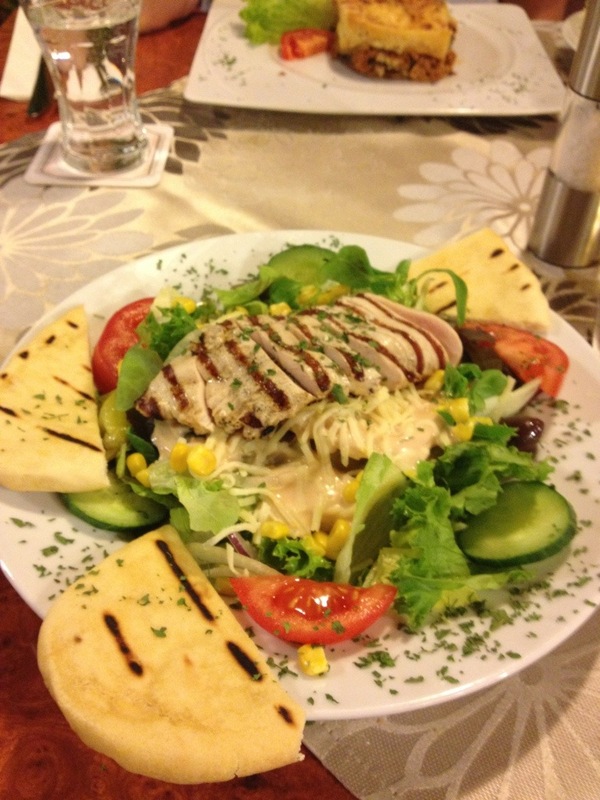 This is James’s chicken salad. We had a very enjoyable meal and a very decent price. 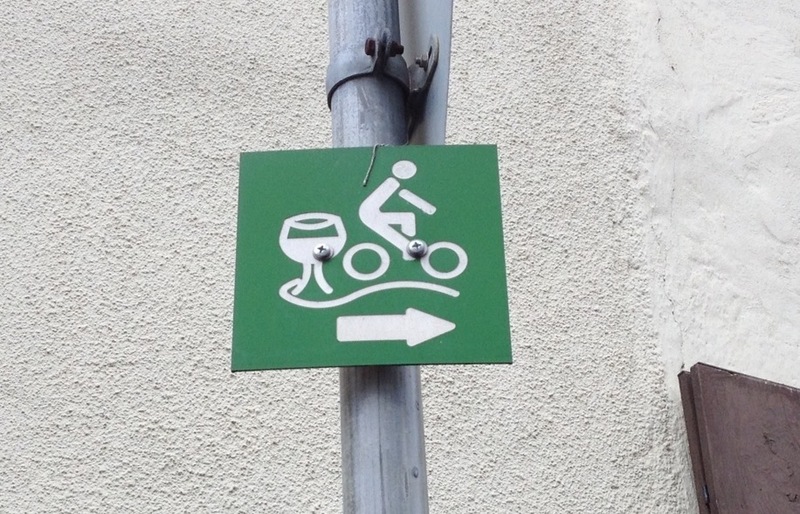 Whilst walking back I noticed this sign – could this be me by next year? 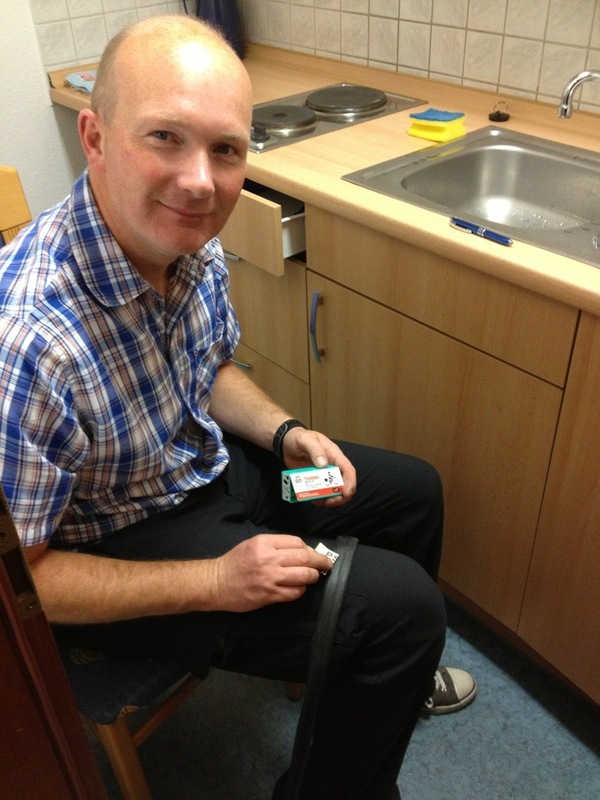 When we got back James remembered he needed to mend his punctured tube so opened one of the new puncture repair kits we got from Rita and got to work. 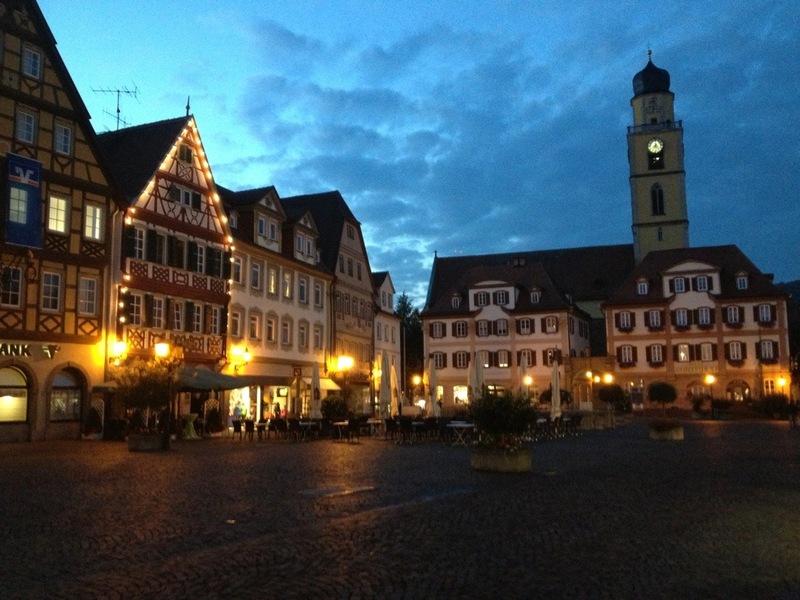 Tomorrow is our last day, a 40 mile ride to Würzburg where we reunite ourselves with my car. 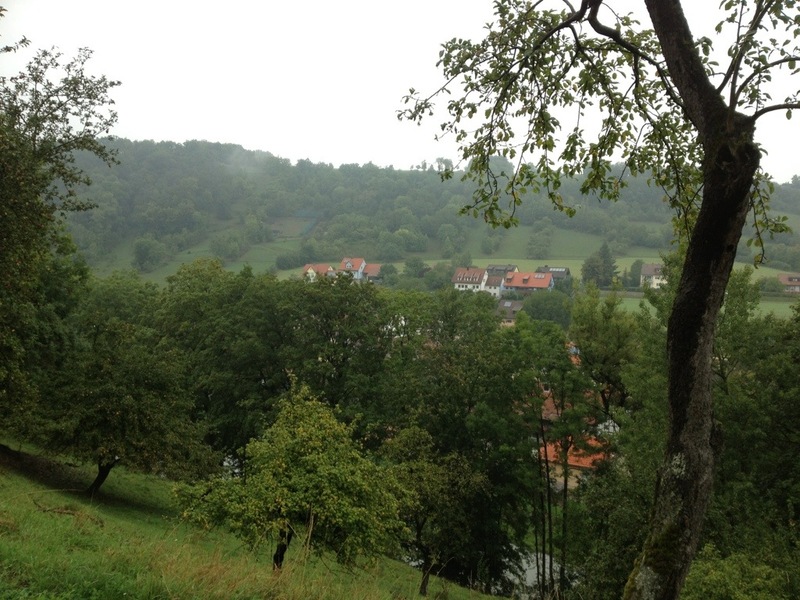 The route starts off along the Tauber river again via Lauda-Königshofen and Tauberbischofsheim before leaving the Tauber at Werbach and heading up the Weizbach river valley to Oberaltertheim where we have to head over some high hills to get to Würzburg. Sounds like you’re having great fun! 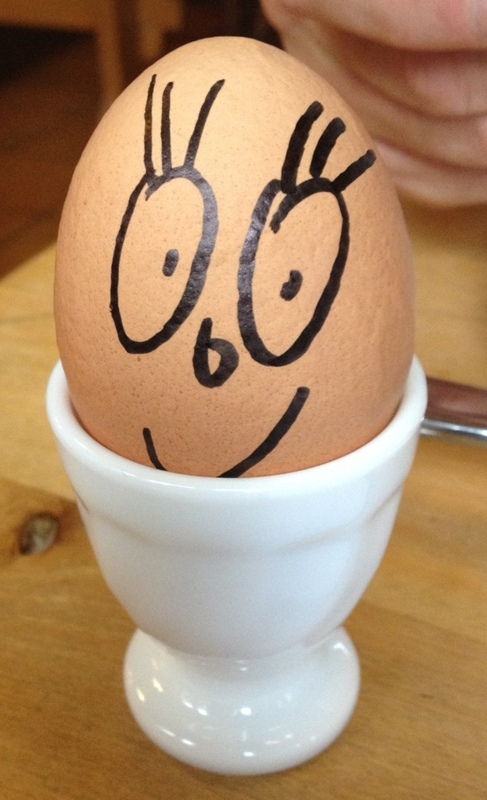 James says he will have to carry out more tests!